There were 167 members present (180 at Hereford last year) for the Council’s meeting in Derby Guildhall on Wednesday last week when the president (Mr. Edwin A. Barnett) presided. The Dean of Gloucester (V. Rev. Gilbert Thurlow) opened with prayer at 11 a.m. and with luncheon interval and a short tea break the business concluded at about 5.30 p.m. Throughout the proceedings there was little controversy this year, and one member described the general atmosphere as “light-hearted”. The Derby D.A. certainly excelled in organising various events during a full week of activities, but because of the necessity for many Council members to be in their own areas for ringing for the Silver Jubilee Day of H.M. The Queen, the success of some of the ventures organized - including the Civic Reception on the Monday (which 300 attended) was mainly due to the loyal support given to the Derby D.A. officers and organisers by members of their own association. Mr. Gordon Halls certainly has the confidence of his ringers and the ability to encourage the success of any activities in which he is involved. “Press-ganged” was the term used by a Council officer when he expressed thanks to the Derby Diocesan Association for their kindness and hospitality. The announcement was made by the Mayor of Derby (Cclr. Jeffrey Tillett) at the civic reception held in the College of Further Education on Monday, June 6, that from midnight the Ancient Borough of Derby would, by order of the Queen, have city status. This announcement was loudly applauded by the 300 or so present. The Mayor, who had been introduced by Mr. Gordon Halls (chairman, Derby D.A.) was welcoming the Central Council to Derby for its annual conference. He said he was indeed delighted that the bellringers had decided to visit the borough, soon to be a city, and hoped that success would crown their deliberations. Mr. Halls then introduced the Bishop of Derby (Rt. Rev. Cyril Bowles) who extended greetings and good wishes to the Council on behalf of the Church and diocese of Derby which is celebrating the (50th) anniversary of its founding and therefore has its own Golden Jubilee Year, coinciding with the Silver Jubilee of H.M. the Queen. The president of the Derby Diocesan Association of Church Bell Ringers (V. Rev. R. A. Beddoes (Provost of Derby)) first spoke of the honour conferred on Derby by H.M. The Queen and said it was a long-neglected honour. The ancient borough had a long history and the bellringers would now play their part and with the citizens of Derby rejoice together. The bells would ring out to all who would hear! There were so many facets of society, but the friendship and fellowship of bellringers were a parable for the larger issues of life. The Derby D.A. was now over 30 years old, and on behalf of the Association he welcomed the Council. It was, he said, an honour to have the members in Derby. Speaking for the Central Council, Mr. Edwin A. Barnett (president) expressed thanks to the Mayor, the Bishop and the Association’s president for the very warm welcome. It was, he said, a pleasure for the Council members to visit the borough - so soon to be a city. It was in 1901 that the Council last came to Derby and it was Sir Arthur Heywood of nearby Duffield who was the founder/president of the Council. The service at Duffield the previous evening had been a fitting remembrance of the Council’s founder, and also for the Golden Jubilee of the Diocese. Mr. Barnett also expressed thanks to the large numbers of ladies and gentlemen who had helped to organise the reception and other events. Mr. Gordon Halls then announced details of the evening’s arrangements and invited all present to enjoy the pomp and ceremony which always preceded and concluded events in the Derby Association’s functions. There was literally a mountain of food for the buffet dinner in the refectory nearby and then socialising, dancing and general happy circulation and renewal of old friendships helped to make the evening one to remember for a very long time. Referring to the previous day’s cricket match in which the C.C. president’s team did battle with the Derby D.A. team, Mr. Barnett said he had hoped to put on a better show himself (he was bowled first ball!) He remembered his cricketing performance during the service at Duffield later and the 121st psalm, “The Lord shall preserve thy going out and thy coming in” - a remark that was greeted with loud laughter and applause. The Lord Bishop of Derby (Rt. Rev. Cyril Bowles) enjoying a pleasant conversation during the proceedings whit Mr. Denis Carlisle (Risley) and Mrs. Norah Carlisle. The Central Council of Church Bell Ringers, assembled in conference in the Guildhall, Derby, offer your Majesty their warmest congratulations on the occasion of your Silver Jubilee. The Queen sincerely thanks the members of the Central Council of Church Bell Ringers assembled in conference for their kind message which Her Majesty in this her Silver Jubilee year greatly appreciates. The President of the Central Council (Mr. E. A. Barnett) expressed his pleasure and that of the Council members at the recovery of Mr. Cyril Wratten (the hon. secretary) from his serious accident sustained in Birmingham in March. Mr. Wratten had been attending an Administrative Committee meeting of the Council and was knocked down by a bus when crossing the road. He sustained several broken limbs all of which have mended satisfactorily. The Council applauded Mr. Wratten who expressed thanks for the sentiments expressed. The Chesterfield Clangers, who are “part of the scenery” in and around Derbyshire, and whose exploits appear in our columns from time to time. Back: Robin Turner, Timothy Ball, Paul Flavell. Others, l. to r.: Sharon Pugh, Melonie Loggenberg, Timothy Swift, David Hird, Stephen B. Queen, Andrew Ball, Sandy Dowell, Christine Ball. POSSIBLY the most important item on the agenda and one that creates the greatest general interest in the Central Council’s deliberations, as well as in the Exercise, is the report and accounts prepared and presented by the Ringing World Committee. Where a sum of about £50,000 is involved it is natural that care and attention should be taken in discussing its administration and the end product. Mr. W. G. Wilson (chairman) proposing the adoption of the Committee’s report said that it had done its best to keep the Exercise informed of progress during the year, by publishing reports of the three meetings held. He drew attention to a yellow circular sent to each C.C. member to encourage them to get new subscribers. It was the duty of C.C. members to help to increase the circulation of the Ringing World, he added. There was a profit in the Accounts of between £4,000 and £5,000 but three-quarters of that surplus was from voluntary donations. It was hoped to maintain the price of the Journal this year and this would swallow up the surplus of last year. In addition, printing costs, paper and postage were all going up. Mr. Wilson thanked Mr. Douglas Hughes (treasurer) and Mr. W. B. Cartwright for help and advice. Also Mr. David Tate, the accountant and auditor, gave tremendous assistance and advice on investments and this was much appreciated. The extra (unpaid) work carried out by the Editor and Miss W. Bartlett was of great help to the production of the Ringing World (applause). Miss Bartlett would be leaving soon and going abroad for a period after her retirement. The committee had the matter in hand and a possible solution which would be made when a decision was reached. The editorial chair, too, would have to be taken over by someone else one day but he (Mr. Wilson) hoped now that the present editor’s health had improved, it would be possible for him to carry on at least until his contract expired in October next year and possibly longer (applause). The junior page and the work done on it by Mr. Iolo Davies (Abergavenny) and Mr. Egglestone’s survey and the possibility of a page of advertisements for guest houses etc., were emphasised in the report. Mr. Harold Rogers endorsed many of Mr. Wilson’s comments and said it was appropriate that thanks should be given to Mr. Wilson for all the time and travelling he gave voluntarily to the Ringing World and its publication (hear, hear! and applause). Mr. J. Barnes asked about covenanted subscription to the R.W. and Mr. Wilson said he would make enquiries. Mr. Gordon Halls expressed the thanks of the Derby D.A. for the excellent production of their special issue. It had been greatly admired and the work on its production appreciated. A question about the special Silver Jubilee issue was raised and answered and Mr. C. W. Pipe emphasised the use secretaries could make of some of the material in the Ringing World C.C. report. The report was unanimously adopted and the council then retired for a luncheon break. After the break the accounts of the Ringing World were studied and, debated, and Mr. Wilson said that in March 1976 investments were £18,900 and were probably now worth £20,000. In March last, £3,000 was invested, £2,000 of the surplus and £1,000 of the recovered tax. A question on the cost of carriage was satisfactorily explained and this concluded the discussion on the R.W. Accounts which, with the other accounts of the Council, were then adopted. “I didn’t get my early morning tea, my newspaper, or the early call I requested”, said a leading officer of the Ancient Society of College Youths at breakfast on the first morning at the Pennine Hotel, Derby headquarters. “Of course, there was a very good reason”, he added: “I put down the wrong room number - 326 instead of 246”. (“What do you expect from a C.Y.”, asked a companion.) We wonder if the occupant of the former room appreciated the service and if he/she was charged accordingly. At one church (Tideswell) during a coach tour, a 14th century bell (about 12 cwt.) was seen standing in one of the side aisles. A card nearby gives the inscription and its translation: Miffi (Messi) de Celis habio nomen Gabriales - I have the name of Gabriel who was sent from heaven. In the same church there were wonderful carvings on the pews. Figures depicting a priest giving the last rites; another baptising a baby, with a small font between the priest and the parent. A bishop and the laying on of hands in Confirmation - and many more. The carvings were everywhere - a wonderful discovery for the visiting ringers. The village and town decorations everywhere were much in evidence during the various tours, and the many unusual pub signs and names were noted. One, “The Church Inn”, was spotted and there was “The Grouse”, as well as “The Grouse and Claret” - the latter evoking a comment by one worthy gentleman: “Very nice - I could do justice to that now - especially the claret”. The driver did not, however, stop the coach to allow him, or anyone, to imbibe. The lifts at Headquarters Hotel (The Pennine), Derby, were so efficient it was impossible once inside to know which way one was travelling (apart from the indicator). One visitor, on arrival, wanted the 5th floor and when another passenger alighted on the 4th, the lift travelled on and the visitor eventually emerged. A ringer who has had the distinction of being master of both the Oxford University Society and of the Cambridge University Guild, is the well-known Bedfordshire cleric and teacher the Rev. Malcolm C. C. Melville. He and his wife Sheila were much in evidence at the principle functions and on the ringing tours. A special vote of thanks was accorded Miss Doris Colgate, president, Ladies Guild, for taking down in duplicate, notes of the meeting all day - a chore she has now done for a number of years. Her help and ability is invaluable both to the R.W. editor and to the secretary of the Council. The Mayor of Derby (Cclr. Jeffery Tillett) will not be “upgraded” to the title of Lord Mayor, although Derby now has city status. Strangely, the regalia worn by all the mayors of Derby is that of a Lord Mayor. The deputy mayor wears the regalia of a mayor! Cclr. Tillett was emphatic that there was no “son” after his name. I am a bachelor, he stated amidst laughter. The tenor king (retired?) was in evidence over the first weekend but on Jubilee Day dashed off south again so as not to miss the opportunity to ring a peal in a tower which only recently has had eight bells installed, suitable for peal ringing. It was an expensive peal we believe. Many of the helpers at the Civic Reception on Monday evening paid for a ticket - and then worked hard!! They were the folk who set the tables, cleared them afterwards, helped generally in the organisation - and some even washed up the plates, cups and glasses - for 300 (plus) diners! “They deserve a medal”, was one comment. Mr. Harry Adams of Chesterfield, who is the senior member of the tower and also of the Association, attended the Central Council Meeting. Unfortunately he cannot now read the R.W. because of failing eyesight, although he has taken it for 40-50 years. 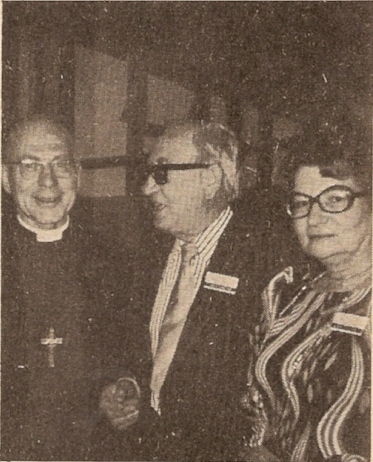 With him are two of his “pupils” - Mrs. Marjorie Phipps and her husband Malcolm. When the deliberations of the Central Council were opened at the Guildhall, Derby on Wednesday June 8, the secretary (Mr. Cyril Wratten) said that the total membership of the Council was 207 and that all subscriptions had been paid. The president (Mr. E. A. Barnett) welcomed Messrs. K. Chambers, S. Richardson, P. G. Smart, A. W. Gibbs, W. S. Croft and Mr. & Mrs. R. L. Byrne, who were attending for the first time this session as recently appointed members. The Council and the visitors in the gallery stood whilst the names of former members who had died, were read out, viz: Messrs. G. E. Oliver, E. C. Berkett, E. Guise, C. W. Ottley, R. G. Black, Rev. W. H. R. Trewhella, W. F. Elliott. J. Ridyard and Miss C. E. (Kitty) Willers. The Rev. J. G. M. Scott (vice-president) then lead in prayer for the departed. There were seven vacancies for honorary membership and seven names were proposed, each being voted upon by a show of hands. The following were elected: Mrs. O. D. Barnett, and Messrs. F. E. Collins, C. K. Lewis, J. R. Mayne, D. Austin, H. Chant and R. H. Dove. After the minutes had been proposed for adoption by the hon. secretary, seconded by Mrs. W. T. Cook, questions were asked about Insurance, Bell Restoration, Methods, and the Council’s Library. These were answered and the minutes, thereafter, agreed. In his report the hon. secretary gave details of changes in representatives of several guilds and associations; spoke of the refunds of tax; mentioned the legal implications of ringers in connection with the 1974 Control of Pollution Act (Noise Abatement) and finally stated that a revised Council Handbook was almost ready for printing. The report was approved after one or two questions had been satisfactorily answered. When the accounts were proposed for adoption by Mr. Wratten it was stated that monies received from the Education Committees publications had been transferred to the Publications Committee who would in future deal with all publications. The general fund excess of income over expenditure was a “book figure”, said Mr. Wratten, mainly because the Hereford D.G. last year paid most of the Council meetings expenses. It was not the policy of the Council to expect the host guild to subsidise the Council’s meetings. There was also inflation to consider and as the membership subscription was last raised in 1974 he proposed that as from January 1 next the subscription be raised to £2.50 per member. Mr. F. E. Dukes seconded. Mr. F. Reynolds said it was not enough and proposed an amendment that it be £3. This was seconded by Mr. W. G. Wilson and eventually approved unanimously. The report of the John Carter ringing machine which report gave details of building work at the Science Museum (Kensington) where the machine is housed, its future use and the demonstrations given and its overhauling was approved on the motion of Mr. Douglas Hughes. It was agreed to send a letter of sympathy and good wishes to Mr. & Mrs. W. H. Dobbie (Mr. Dobbie is one of the trustees) who had been involved in a car accident. Mr. Hughes was thanked for his work for the Carter machine. The Council possesses two beautifully written volumes recording the names of ringers who fell in the two World Wars. Mr. W. T. Cook, the trustee, gave details of these volumes and their use, and the meeting endorsed the acceptance of the report proposed by the trustee. Item 11 on the agenda was the discussion and adoption of 15 Committees and it is seldom that the Council reach this part before the luncheon break. In spite of a later starting time, the business had been dispatched so smoothly that it dealt with five Committee reports and half of the sixth (the R.W.) before a break for lunch. The Administrative Committee had met twice, it was learned, and items reported were: (i) the acceptance of an invitation to hold the 1978 meeting in Guildford, (ii) not to arrange an open meeting in 1977 and (iii) to arrange for ringing as far as possible on Jubilee Day, June 7, in every town and village. The meeting approved the report. The Biographies Committee chairman (Mr. T. J. Lock) proposing the acceptance of his Committee’s report appealed to members to fill in a biographic sheet. If anyone was in doubt, or circumstances had changed, they were asked to obtain another form and ensure that it was sent in completed. There was general laughter when Mr. W. G. Wilson said that “the tenor king” intended to write his own obituary, and renewed laughter when the R.W. editor asked that anyone else who had similar ideas should note that they should write on one side of the paper only! Mrs. J. S. King (chairman) gave two typing corrections in the Public Relations report before moving its adoption which Mr. H. Pitstow seconded. Mr. C. W. Pipe once again brought forward the subject of the Christmas bells selection and quality. This evoked considerable debate, Mr. Pitstow explaining how the towers were selected. Mr. Gordon Halls (Derby), said that Derby was neglected in coverage of such broadcasts, Birmingham and Nottingham getting plenty. However, now that Derby was a city perhaps it would be noticed and Mr. Pitstow would put forward one of their towers. Messrs. Schofield, Groome, Darvill, Hartless and Wilson all took part in the discussion, the latter giving the information that that evening (Wednesday) at 8.15 a TV programme “In the Making” - a story about Whitechapel Bell Foundry - would be shown. The president said that he (Mr. Barnett) had been interviewed for “Midlands Today” in connection with ringing for the Jubilee. It was decided on the proposition of Mr. Norman Chaddock, seconded by Mr. William Butler, to purchase a BBC film which was filmed three or four years ago and would again be shown by that body. It was 16mm sound and colour, entitled “This Ringing Isle” and the cost to purchase would be £230. General approval was expressed by Mr. C. K. Lewis and Mr. W. G. Wilson and questions on security against loss (Mr. M. Church) copyright (Mr. D. Roberts) and a possible reduction to 8mm (J. Hartless) were answered. Congratulations were given to Mr. Chaddock on his successful negotiations, before the adoption of the report was confirmed. Mr. G. Drew, who was welcomed back by the Council after his illness, dealt with the Publications Committee report. As he is moving house shortly, he did not wish, he said, to deal with any additional supply of publications at present. Mr. M. Phipps asked (again) if there was the possibility of a reduction in costs when quantities were ordered by associations. The Committee are to deal with this question at its next meeting. The meeting accepted the report and thanked Mr. & Mrs. Drew for their work. The luncheon break came soon after this report was adopted. The remaining nine reports took considerably longer to accept than had been anticipated. However, a tea break of over half-an-hour gave the delegates a welcome relaxation, and the debates were generally well conducted and good humoured. The Library which is now housed at Sidcup, Kent gave the Committee a chance to prepare a comprehensive report and the librarian (Mr. W. T. Cook) expressed thanks to the Trustees of the Will of the late Mr. Fred Sharpe for their assistance in loading and checking the books for their removal from Launton, Oxfordshire. Certain books which are missing from the list were noted and requests for the return of these made. The Committee asked for a grant of £50 to help with rebinding of books and the purchase of others, as and when they become available. The Administrative Committee have suggested a special bookplate be designed in memory of Mr. Fred Sharpe who did so much for the Council’s Library. Dean Gilbert Thurlow queried whether reports etc. were sent to the British Museum and Mr. F. Duke said the Museum did not want issues of the Irish Bell News. This statement brought several amusing comments and laughter. The question was asked as to whether the Library was adequately insured, and the reply satisfied all when it was noted that it was for £10,000 and for books in transit. The Council thanked Mr. Cook for his work and accepted the Committees report. There was a good deal of discussion when the Towers and Belfries report was presented, the main topic being sound control and excessive noise levels. Unfortunately, because of the wide areas necessary to be covered in order to meet together, the report was not seen by all the members of the Committee before publication. The chairman of the Committee (Rev. J. G. M. Scott) accepted responsibility for the report which was at times criticised by the members of the Towers and Belfries Committee. Certain passages of the report are to be deleted and other parts reviewed. Eventually the report as amended was accepted, with two members voting against. In the absence of Mr. Dennis Beresford, Mr. Alan Frost proposed the adoption of the Committee for Redundant Bells which gave details of some 60 cases which had been referred to the Committee. Several examples of lack of liaison between different sections of the Church of England were instanced to explain how a ring of bells can “slip through one’s fingers”. Details of the sale of various odd bells, advertised in the Ringing World were given and it was agreed that individual enquiries be made if any member wished to follow up the advertisement. Mrs. Jane Wilkinson, who has succeeded Mr. Dennis Beresford as the Committee’s chairman, said that the Exercise owed a great debt to Mr. Beresford who had been instrumental in setting up the Committee. A letter is to be sent to Dennis wishing him a speedy and complete recovery to full health. After the tea interval Mr. J. Barnes (chairman) presented the report of the Bell Restoration Funds Committee. He said that Mr. Martin Fellows had resigned from the Committee and that Mr. Eric Billings had been co-opted. A computer print-out of Trusts likely to by sympathetic had been received, but a code of model rules, although acceptable in London, were not so in Liverpool. He hoped a revised edition of the booklet would be ready soon. Mr. Barnes said the bellfounders could not really supply the costs of various jobs to be carried out as each differed. However, an average arrived at was £1,000 per job. Mr. Gray said he had great admiration for the work of the Committee, but to what was it working and how would details of the information collated be circulated? Mr. Barnes said it was to give details of Trusts and Charities likely to give donations. Posters were being produced on “Operating a Covenant Scheme”, and details would be published in the R.W. There were several years of work still to be done. When a questioner asked if the Committee was to become a permanent Committee, the president said that if the Council decided so, it would be made permanent. Mr. N. J. Diserens said there was a great disadvantage in combining all Bell Restoration Funds and Dean Thurlow said that in Gloucester the Fund had been added to another charity registered fund which saved any taxes from being paid. Mr. Lufkin in proposing the adoption of the Peals Analysis report gave several corrections and there was little discussion except that a peal of P.B. Cinques at Accrington rung on the 11 bells that were then in the tower was accepted. The report was approved, but there were 15 or so dissenters. When Mr. J. R. Taylor put forward the Computer Co-ordination Committee’s report for adoption, Mr. Schofield said that a composition submitted last October still had not been published. Mr. Taylor said that all compositions had to be submitted to the Peals Composition Committee, and the report was then accepted. Mr. Barber asked if compositions published in the correspondence columns were correct, and Mr. Critchley said he had no jurisdiction over what the editor of the R.W. published on the letters page. A question on computer checking systems was raised and it was pointed out that it was not feasible for any one computer checking to be accepted. It depended upon the system used. If a peal composition was marked “computer checked” it was necessary to know the system used or it would be rechecked by the proper committee. Mr. Mew asked that corrections and amendments appear regularly and on the same page of the R.W. The Council accepted the report. Several amendments were given by Mr. D. E. Sibson when he submitted the Records Committee’s report for adoption, and after these had been accepted the report was adopted. There was no printed report submitted by the Methods Committee, but Mr. F. Blagrove asked if the Council would accept the definition defining standard calls and variations. Mr. D. Frith said he did not think the information now given verbally was full enough. Mr. John Baldwin said he had suggested a postponement last year, and the Council had had a year to consider the information. Mr. Frith asked if the verbal report was accepted, was there any hope of the Doubles Methods book being published soon. If the Committee could not get it out, was there any objection to letting someone else produce it. Mr. Blagrove said he had consulted with Mr. G. Drew and the book could be published quickly by Roneo process. The Council accepted the recommendations made by the Committee allowing Doubles and variations to be published. The president expressed thanks to the members of the various committees for their work during the year. The Council will meet on May 30 next year at Guildford, the 29th being Spring Bank Holiday. There was no invitation extended for the 1979 meeting but Mr. P. Corby extended one for 1981 on behalf of Kent C.A. In 1980 the Council has an invitation to visit the Winchester and Portsmouth D.G. ; in 1982, Salisbury D.G. and Bedford Association have extended invitations; and 1985 - Sussex C.A. Under Other Business a letter was read from the Rector of Launton, Oxfordshire, regarding a tablet in memory of Mr. Fred Sharpe, and inviting contributions. Mr. T. G. Pett spoke of the Memorial Fund for Mr. Sharpe and Canon Wigg which the Oxford D.G. had opened. In all £700 had been contributed, mostly by various associations. Two tablets costing £350 had been ordered and were to be placed in Christ Church Cathedral, where there were already three tablets to previous masters of the Guild. The remaining amount was to be given to Nether Winchendon for rehanging their bells. He had not heard beforehand about the Launton appeal, but the Oxford D.G. had made a donation. Mr. Wilson suggested £10, but the president as an amendment proposed a retiring collection which, on a vote, it was decided should take place. The final event of a busy week was a cheese and wine party at George Roobottom’s farm at Sudbury. About 100 attended and were well supplied with food, wine and beer. Gordon Halls used the occasion to thank the many people who had helped to make the week’s activities so successful. He also congratulated the C.C. members who had stayed the whole course, not missing an event, referring in particular to Tom Page and to Frank Lufkin - the latter having earlier that day been in the party of 18 who walked the 3½ wet, muddy miles down Dovedale (presumably in order to avoid ringing at Ilam). Frank Lufkin replied on behalf of the C.C. and thanked the Derby D.A. and Gordon Halls in particular for all the hard work and attention to detail which had gone into the preparations for entertaining the Central Council. Mr. C. W. Pipe once again proposed (at length!) that shorter peals be approved - 3,500 changes. We cannot remain inflexible over a 300-years-old practice he said. After several comments had been made - many in a facetious manner - Mr. Corby said it was not in order to discuss or take a vote on such a matter without previous notification in accordance with the rules. The motion was withdrawn but Mr. Pipe said he would bring it forward again next year. He was making progress, for at least he had a seconder (Mr. E. Billings). Thanks to the president and secretary for the way the meeting had been controlled and the business despatched, were proposed by Mr. W. G. Wilson, and the members loudly applauded. When the president saw one gentleman standing at the exit door at the back of the Hall, he interrupted a debate and invited the gentleman to come to the front where there were empty seats. Mr. Gordon Halls rose and said: “No! No! he’s the chucker out!” which caused great amusement. During this debate a very young lady seated in the gallery with her father evidently spotted her mother in the hall below. The child promptly set up a chorus of “mummy - mummy” which father could not stop. The president regretfully stopped the debate and requested father and daughter to leave, but mother below continued to take part in the discussions. The cost of increased postage for R.W.’s (which went up on June 13) will cost up to £100 to £150 more this year, but this is not going to be charged to the subscribers, it was stated. It is hoped that many subscribers will send the extra voluntarily. Mr. Wilfrid Wilson was delighted when the Ringing World Committee’s report and accounts were due for presentation as it was still in the morning session. “It usually comes after the lunch break and, the anticipation of presenting it and answering questions usually spoils my appetite”, he said - although none of the members believed this statement. “Now it will be over before lunch!” he added. “You assume it will be finished!” quipped the chairman, amidst laughter. Speaking of the Derby D.A. special issue R.W., Mr. Gordon Halls said he had a pile to dispose of and the members could purchase a copy at a special rate - 15p each! Mr. Harold Rogers gave details of efforts made to reduce the sound of the bells in Isleworth and said: “We did all sorts of things on the floor!” - and looked surprised when everyone burst into laughter. “It hasn’t improved the striking at Isleworth”, someone said - amidst renewed laughter. When Mr. C. W. Pipe was in full swing, explaining his reasons for shorter peals, he said “people living nearby perhaps were feeling unwell or had a headache” - at this point a number of the company all said “Ah! !” with laughter following. But at the end Mr. Eric Billings seconded Mr. Pipe’s proposal, which delighted Mr. Pipe. However, Mr. Billings, when it was stated that the subject would be brought up again next year said he would tender his apologies for absence NOW! A call for five volunteers to take part in a peal at Inveraray the following Saturday was made on behalf of Mr. Norman Chaddock, but we do not have details of anyone who came forward. The 300 or so people present at the Monday Evening reception for Central Council Representatives at Wilmorton College of Further Education had the feeling that history was in the making. The Royal Silver Jubilee, the Diocesan Golden Jubilee and the 300th anniversary of 10-bell ringing at Derby Cathedral was quite sufficient to justify the week’s bellringing festival organised by the Derby Association. But the gathering at the reception was both surprised and delighted when the Mayor, Cllr. Jeffery Tillett, in his welcoming address, announced that the Town of Derby would receive City status at midnight. During the evening the president of the Derby D.A. (V. Rev. R. A. Beddoes), Provost of Derby Cathedral, with the farsightedness with which he has, on so many occasions in the past, given wise and imaginative leadership, once again seized the opportunity and rose to the occasion. He immediately ordered the Cathedral Ringing Master, David Friend, to open the Cathedral tower at midnight so that the bells could be rung to inform the town dwellers that Derby had become a City. The proceedings at the reception closed 20 minutes earlier than planned, with the pomp and ceremony customary at the Derby Dinner. The Derby ringers made a large circle round the Central Council members who had stayed to the end and sang the traditional good-night hymn, Auld Lang Syne and the National Anthem. Everyone was invited back to the Cathedral for the midnight ring. The newly decorated belfry was filled with ringers from all parts of the country. Touches were confined to four bob leads of Grandsire Caters, even so it took nearly an hour to give every ringer a pull. Fittingly, the final touch, a bob course of Stedman Caters, was rung by the Cathedral band. Despite the lateness of the hour, the quality of striking excited a well deserved round of applause from the tired onlookers. The president of the Association brought the proceedings to a close with another piece of his typical magic. He produced three large bottles of wine and, although there were so many present that glasses had to be shared, all were happy to endorse his toast “The City of Derby and its finest building.” Geoff Paul, a former Cathedral ringer, was called upon to use his copper plate style of handwriting to inscribe a suitable heading in the visitors book, and the assembled gathering (36 in all) signed. Later the next day the Mayor of the City of Derby visited the belfry and added his signature. The writer would have liked to report that all went home tired and happy to a well deserved night of undisturbed rest. However, he was roused from his sleep at 2.30 a.m. by a worried father from Darley Dale who wanted to know why his daughter had not arrived home. He was informed that the Peak District members had participated to the full in the night’s events which had had an unusual but historic turn. The service on Sunday, June 5 which was based on the special form of prayer published for the Silver Jubilee, was well attended by visiting ringers, Derbyshire ringers, and members of the Duffield congregation. The singing was led by a choir comprising visiting ringers, Derbyshire ringers, and members of Duffield and of Sawley. The choir was conducted by Stuart Pratt and the organ was played by Olwen Fisk, Special choir items included an introit - Lord for Thy Tender Mercies’ Sake (John Hilton), and an anthem - Glorious is Thy Name (from Mozart’s 12th Mass). The service was conducted by the vicar of Duffield, Rev. Geary Stevens, the preacher was the President of the Derby D.A. and Provost of Derby, the V. Rev. R. A. Beddoes, and the lessons were read by the President of the C.C. (Mr. E. A. Barnett) and the Secretary (Mr. C. Wratten). Three leads of Bristol were rung at Long Eaton Old Town Hall, being the only occasion this method has been rung on the bells. Paul Flavell, Norton, circled the bells during this touch after which David Hird, Derby, rang the back six down; on his own; in peal. Owing to ease of handling, the bells were heard 20 miles away. Rounds, Queens, Tittums and Whittingtons were rung on the back 10 at Elvaston Castle. And on the back 12. Tenor 5-0-24 in C.
Gordon Halls failed to ring Bob Minor on the bells at Chatsworth. Excessive frame movement here. About a quarter of a mile during the afternoon. The bells were heard again at Staunton Harold, first ringing to be heard here for many year, for patients of the Cheshire Home who applauded the performance. Owing to a trip in Duffield the bells were instantly fired by one ringer at the front. With his foot. These recollections may sound like Double Dutch but they are perfectly true. Paul Flavell did ring all the bells, tower bells, for three leads of Bristol and the sound of the bells reached as far as Leicestershire, Nottinghamshire and the Essex coast (one of the local customs). However, the bells do have Dutch connections. All the above ringing was performed on Petit and Fritsen’s mobile carillon during its tour in and around Derbyshire for the Central Council Week, Silver Jubilee Week and the Derby Diocesan Golden Jubilee. The carillon was accompanied by Mijnheer Joop de Lange (Yope di Langer - “call me John”), Borough Carillonneur at Helmond, Holland, and his wife, Dicky. Sometimes in quite appalling weather, John played some marvellous recitals at Melbourne, Matlock, Allestree, Staunton Harold, Derby (historic ringing this, the bells were among the first to be heard in the City), Ilkeston, Long Eaton, Elvaston Castle and Chatsworth, assisted at times by Clive Smith from Lichfield and one of the most well-known carillonneurs in North America, Carl Zimmerman. John de Lange is a keen change ringer and is the Captain of the Brigida Change Ringers Guild at Geldrop, near Eindhoven. This Guild has about twenty members who ring with ropes connected to the clavier mechanism on the town carillon. The carillon, weighing nearly four tons, was mounted on a smart yellow lorry and this combination would surely make an interesting study for a police cadet in as much as it was not a fire engine, ambulance or police car, and only sounded its bells while stationary (apart from once or twice when “Bigfeet” was a bit heavy on the brakes). John de Lange managed to grab the majority of the English carillons, Bournville, Saltley, Bond Street and the War Memorial Carillon in Loughborough. The mobile carillon was used for the visit to the latter to show it off to the present Borough Carilloneur, Dr. Peter Stratfold. It then found its way over to Freehold Street and a quick dab on the brakes in the right spot fetched out almost the entire staff and workforce of a famous British bellfoundry. The writer is most grateful to Mr. Paul Taylor for taking it so well because all work at the foundry stopped and no bells have ever been subjected to a more intensive examination by so many experts in such a short period. Whatever their thoughts were (admiration? recasting? ), the Loughborough Carillonneur Emeritus, Mr. W. Eric Jordan, struck out a selection of English popular songs from memory, with the carillon just inside the foundry door out of the rain. The carillon has gone back to Holland now; more’s the pity. The writer hopes it and the de Langes will come again soon; they gave so much pleasure to many during their little visit and even one of the most critical of Central Council representatives admitted that the bells were pleasant to listen to. Thanks to Messrs. Petit and Fritsen for lending the D.D.A. the carillon, and also to every one of the local authorities who sponsored performances to cover costs. Without them the trip would not have been possible. THE TOURS organised for car drivers started on Saturday (June 4) and the first covered a distance of 40 miles. Eleven towers were available, one 10, five 8s, the other five being 6s; and Mrs. Marjorie Phipps was the organiser. On Saturday evening a 15-mile route allowed for six towers, with Michael Foulds arranging the bands, whilst for Sunday, ringing was available from 8.45 a.m. until 11 a.m. covering 13 churches, and Duffield bells were rung before the ringers choral evensong at 7 p.m. The south-west region of Derby supplied 15 towers on Monday for Car Tour 3, starting at 9.15 at Melbourne and finishing at 6 p.m. at Etwall. Between 40 and 50 miles were covered by those who went to every tower, Clive Bryant (Duffield) being the organiser. A slightly less energetic circuit was arranged for Car Tour 4 for Monday, covering about 25 miles and allowing for 12 towers to be “grabbed”. This was arranged in conjunction with the East Derbyshire and West Nottinghamshire Association by Glyn Holgate. There were alternative car tours on Tuesday, the larger no doubt being the 18-tower grab in the Peak District, and covering anything up to 75-80 miles. This went on from 9 a.m. until 8 p.m., fives, sixes and eights being available. Howard Percy of Matlock arranged the tour and we understand that one tower was in fact not available at the times allocated. However, 17 towers is not a small number for even the most ardent collector of towers. The smaller and more leisurely tour (No. 6) had just seven towers and gave a descriptive write up of places worth visiting in between bouts of ringing. However, it started at Matlock at 9.30 a.m. and finished at Crich at 8 p.m., with David Kingman as organiser. In addition there were three towers in Derby open for ringing on Tuesday evening, and these were also available after the Council meeting on Wednesday. Car Tour 7 (10 towers and a Ringing Contest) was the programme for Thursday. The tour covered 26 miles, had 10 towers open and Philip Jones as arranger. The Contest was between the Derby D.A. and the Central Council and took place at 4 p.m. at Ilkeston. This resulted in a win for the Council. The final tour - by coach - left Headquarters Hotel at 9.15 on Friday, five towers being used and again the Derbyshire Dales were viewed with interest. Walking was encouraged and the hikers went from Milldale to Dovedale where they re-entered the coach before the return to Derby. Mr. D. Clowes was the supervisor. Other forms of entertainment - apart from leaning on the bar in various hostelries - were a Square Dance with “Quality Buffet Supper” at Risley Village Hall from 7.30 to 11.30 p.m. on Thursday. The numbers were limited to 100, and those who attended were certain of a first-class evening, Mrs. Nora Carlisle being the organiser. George Roobottom’s Farm at Sudbury, Derbyshire (Mackley House Farm) was the meeting place for a Wine and Cheese Party on Friday evening and this made a pleasant finish to a lively, if exhausting, week of activities. In between, at various places, the Petit and Fritsen Mobile Carillon gave concerts and there was great interest in this unique instrument wherever it went. The headquarters hotel (the Pennine) had an information desk on the first floor with posters, leaflets, folders, etc., available, and this was manned by Derby D.A. members at certain hours. The Council members were (generally) identifiable, for yellow discs had been circulated, whilst Association members in any advisory capacity had lapel badges with their names on them. The cricket match on Sunday was held on the King George V Playing Fields, Littleover and was a limited-overs match. George Peach was the organiser and because of difficulties getting a full team together from the Central Council, the Derby D.A. team allowed “outsiders” to help out. The Derby team took control and won by five wickets. It was a very entertaining afternoon. On the day of the Council’s deliberations (Wednesday, June 8) a service of Holy Communion was held in the Cathedral at 8.30 a.m. This was attended by 40 to 50 people, the Provost of Derby (V. Rev. R. A. Beddoes) officiating, assisted by the Rev. Fred Ross (Association Secretary). “We had a very eventful journey back after the C.C. meeting from Derby to Dorset. At Towcester the car exhaust fell off! That was 8 p.m. and it was midnight before the garage in Northampton had mended it. We arrived home at 3.05 a.m. and Simon was delighted to see the sunrise! When we arrived in The Square at Towcester to await the A.A. we heard the ‘magic noise’, but it was only the church clock chiming - not practice night as we had hoped!”- From Judith Robertson. 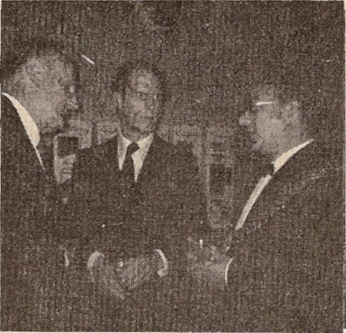 The president of the Central Council, Mr. E. A. Barnett (l.), and the secretary, Mr. C. A. Wratten, chatting informally to the Mayor of Derby (Cllr. Jeffery Tillett) at the civic reception. While all the national sporting media were trying to get us excited about some forthcoming cricket matches between England and a collection of Australian “blokes”, the only match that really mattered was being played at Derby, between teams representing the local association and the Central Council. It was one of the curtain-raising events of the Central Council’s week-long visit to Derbyshire and, unlike the rest of the week, the weather was kind. The Derbyshire team won the toss and decided to put the Central Council in to bat, and despite their specially-imported Yorkshire openers they saw their first two wickets go down for only one run. A third-wicket partnership between Gordon Halls and Timothy Pett developed and put on 19 runs before Gordon was bowled for 7 by Peter Rose, the Derbyshire captain. Teddy Barnett came and went after receiving a first ball that, while not fast, was rather too straight, and Tom Page received a rather less kind delivery which struck him high up on his right arm, giving him a quite vivid souvenir to take back to Aldershot. Tim Pett went on to score a useful 18 before falling yet another victim to the Derbyshire captain. With his “demise” the Council’s tail-end was soon mopped up for a total of 49 runs all out. The Derbyshire side managed to pass this total for the loss of only four wickets; top scorer with 18 runs not out was Chris Wood (Ticknall). However, special mention must go to Martin Halls, Gordon’s son, who also played for the Central Council side and took all four Derby wickets for only 2 runs. After the match the teams enjoyed a tea prepared by the local ladies, and Mr. Barnett delivered a short “thank you” speech. CENTRAL COUNCIL v. DERBY D.A. The contest was rung on the eight at St. Mary’s, Ilkeston, on June 9th, at the end of the Ilkeston District Tour. The rules required each team to ring 252 changes of Stedman Triples and a course of Surprise Major. The Derby D.A. team included two ringers from each of the four districts, namely:- Howard Percy, David Kingman (Peak); David Hird, David Friend (cond.) (Derby); David Marshall, Philip Jones (Ilkeston); Paul Flavell, Tim Swift (Chesterfield). The C.C. team comprised: Tom Lock (cond. ), Middlesex C.A. 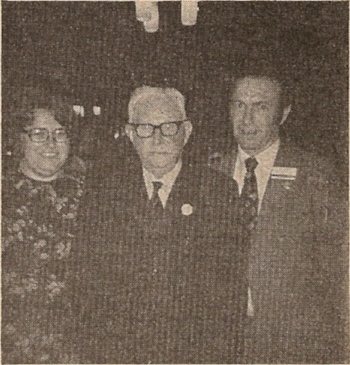 ; Tom Page, Guildford D.G,; Beryl Reed, Southwell D.G. ; Harold Rogers, London C.A. ; Frank Lufkin, Essex C.A. ; Ian Campbell, Beverley and District Society; Ken Darvill, Oxford D.G. ; Jeff Kershaw, Lancashire Association. The C.C. lost the toss and the D.D.A. captain elected to send the C.C. in first. The C.C. were allowed a short practice, being unfamiliar with the bells - for this they rang plain hunt and then rang an excellent 252 of Stedman, followed by an equally good course of Yorkshire. Impressed, but undeterred, the Derby team took over, and rang their 252 of Stedman, marred only by some uncertainty as to whether the method has dodges in 4-5 as well as 6-7. The Derby team also chose to ring Yorkshire, and this was accomplished without problems. The judge, Brian Burrows (Leicester D.G.) announced the very close result: Central Council: Stedman, 21 faults; Yorkshire, 15. Total 36. Derby D.A. : Stedman, 21½; Yorkshire, 16. Total 37½. Thus the C.C. were the winners. The third session of the 29th Council - the Council’s 80th annual meeting - was held on Wednesday, 8 June, in the Guildhall at Derby. The chair was taken by the Council’s President, Mr E A Barnett. The meeting was opened with prayer, led by the Very Revd. A G G Thurlow, Dean of Gloucester and a past President of the Council. The Secretary (Mr C A Wratten) reported that 65 societies were affiliated to the Council, with 174 representative members. The Rules provided for 24 Honorary members, and there were nine Life members. The Council thus had a membership of 207. There were no vacancies, and all subscriptions had been paid. Four members who had joined or re-joined the Council for this meeting were welcomed by the President. They were Messrs K Chambers (Coventry), P G Smart (Guildford), A W Gibbs (Police) and W S Croft (Winchester and Portsmouth). Three other new members, Mr S Richardson (Carlisle) and Mrs M P Byrne and Mr R L Byrne (both Truro), were not present. The Council stood in silence as the President read the list of past members of the Council who had died since the last meeting: Messrs C W Ottley (London County 1963-66, died 2 June 1976); R G Black (Peterborough 1927-39, died 19 June 1976); G E Oliver (Hereford 1948-60, died in September 1976); the Revd W H R Trewhella (Truro 1932-36 and 1951-54, died 2 September 1976); Messrs W F Elliott (Hertford 1929, died 7 September 1976) and J Ridyard (Lancashire 1951-63 died 13 February 1977); and Miss C E Willers (Ely 1933-39, died 17 February 1977). The Vice-President of the Council, the Revd J G M Scott, said a short prayer. Before accepting nominations for the seven vacancies among Honorary members (seven Honorary members having completed their three-year term), the President reminded the Council that there had been general agreement last year that it was helpful if reasons were given for any nomination. Six of the retiring members were then proposed for re-election: Mrs O D Barnett, wife of the President, proposed by Mr W G Wilson (Life) and seconded by Mr F E Dukes (Irish); Messrs F E Collins, a member of the Towers and Belfries Committee, by Mr K S B Croft (Winchester and Portsmouth), seconded by the Revd J G M Scott (Devonshire Guild); C K Lewis, a member of the Council since 1948 and who had served on the Methods Committee for 27 years, by Mr A F Scholfield (Chester), seconded by Mr F T Blagrove (Middlesex); J R Mayne, a member of the Records Committee, by D E Sibson (Cumberland Youths), seconded by Mr R E Hardy (Hertford); B. Austin, a member of the Tower and Belfries Committee, by the Revd J G M Scott, seconded by Mr J Freeman (Life); and H C Chant, well-known for his work on Spliced Minor and his articles in The Ringing World, by Mr E Hudson (Yorkshire), seconded by Mr D A Frith (Lincoln). Mr R H Dove wee proposed for the seventh vacancy by Mr B Harris (Stafford), who said that the latest edition of Mr Dove’s “Guide to the Church Bells of Britain” was a great contribution to the Exercise, and seconded by Mr C M Smith (Stafford). The seven nominations were then voted on individually, the President having accepted, in reply to a question from Mrs M J Wilkinson (Honorary), that this procedure might entail a vacancy if any of the nominees were not elected. Messrs Austin and Dove were then elected by large majorities and the remaining five without opposition. As a result of this election Sir John Betjeman, the seventh retiring member, ceased to be a member of the Council. The Secretary moved the adoption of the Minutes of the 1976 meeting at Hereford, as published in “The Ringing World” of 11 February 1977 and circulated to members; Mr W T Cook (College Youths) seconded. After the Minutes had been adopted, the Secretary said that he was following up with the Ecclesiastical Insurance Office and the chairman of the Towers and Belfries Committee the question of insuring members of that committee while engaged in work on the Council’s behalf; that copies of the survey of bell restoration funds had been sent to all affiliated societies as agreed; and that last year’s report of the Methods Committee had been published in “The Ringing World” of 2 July for general information and to give Doubles ringers an opportunity to comment to the committee. Before moving on to the next item on the agenda, the President said that the Council was pleased to see Mr Wratten once again sound and well after his recent accident (applause). Although the total membership of the Council remains unchanged since its last meeting, there have been some changes in representatives. Six members - Messrs. G.W. Randall (Coventry), T. Skilton (Guildford), N.S. Bagworth (Police), F.M. Bowers and W.R. Curtis (Truro), and G. Nabb (Winchester and Portsmouth) - have been replaced by Messrs K. Chambers, P.G. Smart, A.W. Gibbs, R.L. Byrne and Mrs M.P. Byrne, and Mr W.S. Croft respectively. Mr Nabb had been a member of the Committee for Redundant Bells. Arising from the Council’s registration as a charity in September 1975, just ever £1,000 has now been received from the Inland Revenue in repayment of tax on Ringing World investment income; a further but much smaller refund of tax paid on Clement Glenn Bequest interest and on Publications Fund profits is awaited. On the initiative of Mr W.B. Cartwright, Counsel’s Opinion has been obtained on the legal implications for ringers of the 1974 Control of Pollution Act, which amongst other things superseded the earlier Noise Abatement Act. The Council is indebted to Mr S.J. Gullick, the Secretary of the Yorkshire Association and one of that Association’s representatives on the Council, for his detailed work on this. As far as I am aware the Act has been invoked to limit ringing on two occasions so far, in Bedfordshire and Yorkshire. Finally, the draft of a revised Council Handbook is now virtually complete, and I hope to be able to place the final version in the hands of the Publications Committee within the next few months, in readiness for printing and publication. Cyril A. Wratten, Honorary Secretary. comparative figures for 1975 remain unchanged. We have audited the annexed balance sheet dated 31st December, 1976 and have obtained all the information and explanations we required. In our opinion, the balance sheet is properly drawn up so as to exhibit a true and correct view of the state of the affairs of “The Ringing World” according to the best of our information and the explanations given to us, and as shown by the books. We have compared the annexed Balance Sheets and Income and Expenditure Accounts of the General, Clement Glenn Bequest, and Publications Funds of the Central Council of Church Bell Ringers with the books and vouchers of the Council. We have also examined the annexed Consolidated Balance Sheet. We have obtained all the information and explanations we have required and report that in our opinion based on our examination and the report of the Auditors of “The Ringing World” not audited by us, the aforementioned accounts are properly drawn up so as to exhibit a true and fair view of the state of the Council’s affairs at 31st December 1976. In moving the adoption of his report, Mr Wratten said that he would be circulating society secretaries about the implications of the Control of Pollution Act. Replying to Mr G A Halls (Derby) he said that he was waiting only for summaries of two or three committees’ work before passing the typescript of the revised Council Handbook to the Publications Committee; he could not however forecast when the Handbook would be available. Mr F E Dukes enquired what period was covered by the tax refund, and was told that it was from 1971, the year of the Council’s registration as a charity. Mrs O D Barnett (Honorary) seconded, and the report was adopted. Introducing the accounts, Mr Wratten explained that, following an enquiry from the Inland Revenue arising from a claim for a refund of tax, he had with the auditors’ agreement changed the way of showing the Education Committee’s expenditure on and income from its publications. These were now included in the publications account rather than the Clement Glenn Bequest. Comparison of 1975 and 1976 figures for these two accounts could therefore be misleading. Turning to the General Fund he said that the surplus of some £57 shown on the year’s working was largely due to the reduction in committee expenditure and the generosity of the Hereford Diocesan Guild in meeting most of the costs of the 1976 meeting. A further expenditure of nearly £100 on library fixtures had been capitalised. These factors, taken together with the continuing inflation, had satisfied him that an increase in subscriptions was necessary. The subscription had last been increased, to £2.00 per representative, in 1974. He therefore proposed that the subscription from 1 January 1978 should be £2.50 per representative, a proposal seconded by Mr F E Dukes. Mr F Reynolds (Lancashire) queried whether such an increase would be adequate, and proposed an amendment that the subscription be increased to £3.00. Mr Wilson seconded. On being put to the vote, first as an amendment and then as a substantive motion, this proposal was approved by the Council. The President said that formal approval of the accounts would be deferred until after the consideration of the Ringing World Committee’s report, and the Council moved to the next item on the agenda. Building operations at the Science Museum, designed to provide much-needed extra floor space, have meant the temporary disappearance from public view of most of the exhibits in the Acoustics Gallery. Many have been removed to an annexe at Hayes, but the Ringing Machine has been retained in its show case in the store at Kensington so as to be available to us for demonstrations. The building works are due to be completed in June 1977, but the redesigning and restoration of the Acoustics Gallery will take some time, and no firm date for its completion is yet available. Mr V.K. Chew of the Department of Physics, who has been responsible for the safe keeping of the Machine since he took over from Dr. Follett in 1957, may be retiring within the next two years. In correspondence with the Trustees he has guaranteed that if the restoration takes place before his retirement, the Machine will be given a place appropriate to its uniqueness and importance, but he cannot commit his successor to this. The Trustees, conscious of the very valuable facilities given by the Museum and its helpful staff over a very long period, have nevertheless stated that, should the Museum wish to discontinue exhibiting it or even move it to Hayes, the Central Council may have to consider finding another home for it. The Museum have subsequently given a firm understanding that no action will be considered or taken without first consulting the Trustees. Meanwhile, during 1976 two successful demonstrations have been given. On 13 March, for an audience of 22 from Ashford, Stedman Caters and Cinques and Prittlewell Surprise Maximus were followed by touches of Plain Bob Major and Stedman Triples called by members of the audience. On 8 May, after giving the machine a good cleaning and oiling, Mr and Mrs Dobbie demonstrated the machine to a group of 37 from the London County Association. Because of the numbers and the interest taken by a few who stayed on, this was a long meeting, during which Kent Surprise Maximus, Double Norwich and Bristol Major were among the methods rung. Moving the adoption of the report, Mr D Hughes (Honorary) said that he was grateful to Mr and Mrs Dobbie for the excellent way in which they demonstrated the machine. Mrs Barnett seconded, and suggested that the Council send its best wishes to Mr and Mrs Dobbie for recovery from the effects of their recent accident. The report was adopted without further comment. The Council possesses two beautifully-written volumes in which are recorded the names of all ringers known to have been killed in the two World Wars. These are in the keeping of the Librarian of St Paul’s Cathedral, London. They are housed in a specially made oak display case, which stands in the south triforium gallery near the Library. The writer, being a member of the St Paul’s Cathedral Guild of Ringers was appointed Trustee of these Rolls of Honour at the London meeting in 1972. He visits the books every so often, and from time to time turns a page in each book. He found one day last year that the books had been removed from their display case. Enquiries showed that this had been done by the Cathedral Librarian, who had been concerned for their safety, and had not realised that there was a Trustee. The matter was amicably cleared up, and the books have been replaced in the display case. The report was adopted on the proposition of Mr W T Cook, seconded by Mr D A Bayles (Durham and Newcastle). The Committee has met twice since the Hereford meeting, in October and again in March. Arrangements were made for the 1977 meeting, and an invitation from the Guildford Diocesan Guild for the Council to hold its 1978 meeting in Guildford was accepted on behalf of the Council: the invitation, which had been the only one received for 1978, was open only until 31 October 1976 and therefore could not be left until the full Council next met, as would normally be the case. In view of the national Jubilee celebrations, in which many ringers were likely to be involved, it was decided not to arrange an Open Meeting this year. The general policy of holding such meetings whenever the Council meets remains unchanged. Following discussions that had taken place between the Hon. Secretary of the Council and the secretary of the Queen’s Silver Jubilee Committee, the Committee also agreed that ringing throughout the country should be asked to ring wherever possible during the morning of June 7 in association with the State Service to be held that morning in St Paul’s Cathedral, London. A message to this effect from the President of the Council was subsequently published in “The Ringing World”. An award scheme to mark the Jubilee Year, proposed by a Mr P. Sullivan-Tailyour, was discussed at length and generally endorsed by the Committee at its October meeting. The scheme however ultimately foundered for lack of a sponsor willing to provide the financial backing required. The report was adopted without discussion on the proposition of Mr C A Wratten, seconded by Mr F E Dukes. E.C. Birkett National Police Guild, 1957-66. Died 19 March 1976. Attended 2 meetings. E. Guise Gloucester & Bristol Diocesan Association, 1925-29 and 1932-48. Died 10 May 1976. Attended 9 meetings. C.W. Ottley London County Association, 1963-66. Died 2 June 1976. Attended one meeting. R.G. Black Peterborough Diocesan Guild, 1927-39. Died 19 June 1976. Attended 7 meetings. Revd. W.H.R. Trewhella Truro Diocesan Guild, 1932-36 and 1951-54 Died 2 September 1976. Attended 3 meetings. W.F. Elliott Hertford County Association, 1929. Died 7 September 1976. Attended one meeting. J. Ridyard Lancashire Association 1951-63. Died 13 February 1977. Attended 11 meetings. Miss C.E. (Kitty) Willers Ely Diocesan Association, 1933-39. Died 17 February 1977. Attended 6 meetings. The death of G.E. Oliver has also been noted, but so far identification has not been established. The Committee are anxious to receive all outstanding Biography sheets from members; if required, spare blank sheets can be provided. Moving the adoption of the report, Mr T J Lock (Middlesex) said that information now to hand confirmed that Mr G E Oliver had been a member of the Council. He asked all members to ensure that they had completed a biography sheet, a point reiterated by Mr W H Viggers (Honorary) in seconding. Answering Mr J R Mayne (Honorary) Mr Lock confirmed that the late Mr Elliott’s initials were indeed W.F. and not F.W. Another member of the committee, Mr G A Dawson (Sherwood Youths), said that many former Council members had never completed biography sheets and said that any help in completing the committee’s records would be welcomed. Commenting light-heartedly on the latter point, Mr W G Wilson said that a ringer well-known as “The Tenor King” [Mr A P Cannon] had informed “The Ringing World” that he wished to write his own obituary: by filling in a biography sheet Council members would obviously be able to do the same (laughter). This second report from our Committee tells of continuing work, watchfulness and co-operation from our three members. Before going further we must express our sincere thanks to Mr Fred Dukes, Mr John Dunwoody, Mr Denis Bayles, Mr Eric Naylor and Dr John Baldwin for their help with news items, BBC contacts and general information. Mr Harold Pitstow, OBE, has continued his work, the climax of the year being the “Christmas Bells” programme, which he handled with his usual consideration and tact with both the towers concerned and the BBC. Once again it proved an interesting programme, appropriate for ringers and laymen alike. Our Overseas Liaison Officer, Mr George Pipe, has once again proved his worth and capacity for hard work, in connection with the Overseas Directory. We have dealt with some twenty requests for information from ringers preparing to leave the UK. The directory is continually being updated and enquiries from anyone needing assistance are very welcome. “Ringing, if not actually practised all over the world, is certainly read about and talked about from Ascension Island to Zambia”. The new edition of Dove’s “Guide” has completely updated the list of overseas rings of bells, and it is interesting to note the work now on the bell founders’ books. From the Whitechapel Foundry there is a new 8 (tenor 8¾ cwt. in A) for St. James’ Episcopal Church, Hendersonville, South Carolina, and the historic octave of St. Philip’s, Sydney, NSW, is en route to England for full restoration. At Loughborough two trebles are being cast to complete the octave of St James, Turramurra, NSW. A ring of 13 bells (tenor 25 cwt) has been ordered for Christchurch Cathedral, New Zealand, to replace the existing 10; they are expected to be installed early in 1978 in time for the centenary of the Cathedral. It is hoped that the front six of the old ring will be installed in another church in Christchurch and thus give New Zealand its sixth ring of bells. Please let us know of any additional information in order that our files may be kept up-to-date. On radio and television interest in ringing has not waned and all regions seem to delight in using the sound of bells: in fact, every “Sunday morning” in a production is invariably accompanied by the music of bells. Once more the material gathered during the year is too much to condense into a limited report, but it is available to anyone requiring it. Only a brief mention of interesting points can be made here. BBC Cardiff has built up a library of recordings of “Bells in Wales” for transmission on Sunday mornings. Two towers were selected from each diocese in the Principality, and all are regularly used. In the Western Region there was an interesting series of recordings made at Burford and entitled “On Visiting the Bell Tower”. The programme went out on Sunday mornings at 7.45 and gave correct, interesting information about the church tower, bell chamber, clock, and raising, ringing and lowering the bells. Unfortunately the broadcast was much too early for most listeners. In the Northern Region Ormskirk bells were included in the “Christmas Bells” programme. In the Eastern Region handbell ringing at Christmas came from Norwich; morning services from Duston, Barnwell and Burton, all in Northants, were introduced by bells; and both Soham, Cambs, and Stamford, Lincs, broadcast appeals for ringers for their bells. There was also wide publicity on TV and radio for the medieval bell stolen from Hadleigh, which happily was later recovered. There was excellent coverage by both media of the Suffolk Guild’s commemoration of the John Constable bicentenary in June, when the bells of 11 churches in the Stour Valley were heard. Sir John Betjeman’s brilliant TV programme, “A Passion for Churches”, was once again shown as a treat for many. Radio Orwell gave good coverage of the dedication of the new ring of 12 bells in Ipswich. In Ireland, Drumbo bells were particularly well covered daring the year, by BBC Radio, BBC 1 Television, Downtown Radio and Ulster TV. The bells of St. Thomas, Belfast, and Christ Church and St Patrick’s cathedrals, Dublin, were featured in BBC, ITV and Radio Telefis Eireann coverage of the “Bells for Peace” day on 20 November, the latter also being broadcast in association with the memorial service for the murdered British Ambassador, Mr H.E.C. Biggs, and Miss Judith Cooke. Christ Church Cathedral bells were also broadcast as they rang for the installation of President Patrick Hillery in Dublin Castle. At various times Hillsborough, Lurgan, Londonderry Cathedral, Doneraile and Arklow bells were also broadcast. There was similar extensive cover in the Irish Press of ringing activities, the Irish Times in particular publicising the bells of St Audeon’s, Dublin, and pointing out that £6,000-£7,000 was needed to restore them. Outside radio and television, useful contacts have been made through the Church Information Office which will enable us to keep them up-to-date with activities within the Exercise. As from the Derby meeting, we plan to send details of our conference to all regional newspapers. In the South Wales area and in Suffolk a worthwhile association has been formed with the National Society for Gifted Children. Campanology is now one of the activities on the curriculum for their Young Adventurers Groups. The aim is to integrate these children into their local bands. The Woman’s Institutes have shown enthusiasm for talks on bell ringing and one member of our committee is kept busy organising these, and this again has proved a valuable area for recruits. Again, as we conclude our report, we would remind every ringer in the land that he or she is also a very valued member of our committee, for the acceptance and appreciation of our art by the general public rests with each individual ringer. Mrs J S King (Llandaff and Monmouth), proposing the report’s adoption, said that Buxton, referred to in the ninth paragraph, was in Norfolk; Mr H N Pitstow (Honorary) seconded. Mr C W Pipe (Suffolk) said that, as he had said at previous Council meetings, he felt that the “Christmas Bells” broadcast could be improved. He thought that greater variety was possible in the choice of bells broadcast in the programme; and also that the BBC could vary its choice of recordings of bells for the 7.45 am Sunday broadcast. Mr Pitstow explained that the bells broadcast in the Christmas morning programme consisted of one ring of 12, one of 10, three of 8, and two of 6, and that he asked colleagues in each BBC Region to nominate a tower for him to recommend to the BBC. Recently he had started to receive, either direct or via the BBC, requests from towers to be included in the broadcast. Although some of these requests could be met, most must inevitably be disappointed. Throughout the intention was that the programme should contain a cross-section of typical ringing such as the public could expect to hear on Christmas morning. Continuing, he said that the bells broadcast on Sunday mornings were selected from those recorded for “Christmas Bells”. At one time the same record tended to be used for lengthy periods, but there had been more variety following an approach he had made to the BBC. He would however see whether more could be done. Mr Halls lamented the lack of Derbyshire towers in the Christmas programme, and Mr C J Groome (Peterborough), saying that he represented the Guild with the greatest number of 5-bell towers, urged the inclusion of a 5-bell tower. Both Mr A F Scholfield and Mr J Hartless (Winchester and Portsmouth) congratulated Mr Pitstow on the good relations he had built up with the BBC (hear, hear), the former pointing out that the “Christmas Bells” programme was intended not just for ringers but for the general public. A booklet on the Elementary conducting. It is not intended that this should supplant the Council’s existing publication, “On Conducting”, but will cater for the bob-caller forced by circumstances into calling touches of Grandsire Doubles or Plain Bob Minor. A booklet on elementary methods. This much-needed publication will form a sequel to the Beginner’s Handbook, taking the learner up to Treble Bob. Sets of exhibition material. Six sets of large cards containing photographs, diagrams and explanatory notes on ringing are being prepared. When completed it is proposed to site these at convenient centres round the country, and they will be available for loan, the user arranging transport each way. A request in “The Ringing World” for assistance in producing photographs evoked no response. Leaflets on “Conducting Stedman Triples” and “Elementary Method Construction” are being prepared. The leaflet on “Conducting Grandsire Triples” has been revised before being reissued. The work on an 8 mm film on casting, tuning and hanging is proceeding, albeit very slowly. The committee appealed for advice and ideas from those interested: none was received. The sale of the “Rhythm of the Bells” record has continued throughout the year, as has also the sale of the film strip, “A Ring Restored”. Stocks of the latter are nearly exhausted, and it is proposed to order a new supply. Contact is being maintained with the theological colleges. They were all circulated during the year: the few replies that were received noted where to apply for assistance if required. One of the original aims of the committee was to see the instructional course established. None of these are organised by the committee, although individual members are often involved. 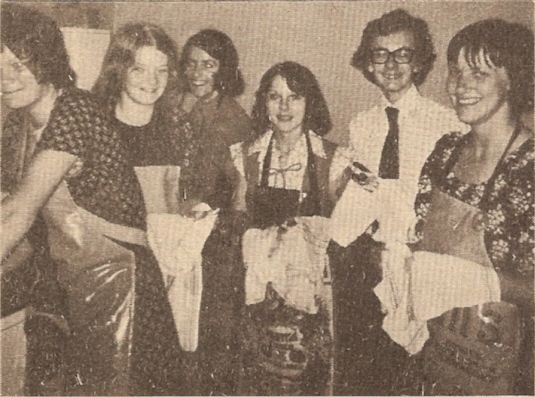 During 1976 residential courses wars held at Brant Broughton by the Lincoln Diocesan Guild; at Hereford by the Hereford Diocesan Guild; at Loughborough by the Leicester Diocesan Guild, and at Easthampstead by the Oxford Diocesan Guild. Evening classes were held by the Middlesex County Association in Fleet Street, and by the Oxford Diocesan Guild at Tilehurst. Half-day and one day courses were organised by many guilds and associations throughout the country. The committee is always willing to give advice and help to any attempts in this field. Mr W Butler (Oxford Guild) proposed the report’s adoption. Commenting on it, he said that the committee hoped to have six sets of the exhibition material referred to, and suggested that some societies might like to buy a set: if so, they should contact him within the next few months. He also said that a better copy of the Washington film had been obtained, and mentioned a TV film in which Mr F E Collins (Honorary) had given a very interesting talk on ringing. Mr J M Tyler (Peterboro’) seconded. Mr N Chaddock (Honorary) said that he had been in touch with the BBC about a TV documentary film entirely devoted to ringing, entitled “This Ringing Isle”. The Corporation had no plans to re-transmit the film, nor was it intending to place a copy in its library. It was however prepared to sell a 16mm sound/colour copy to the Council for £230 plus VAT, subject to certain conditions. Although one of the latter was that the film should not be hired out for profit, there would be no objection to a hire charge to recover postage and the capital coat. This was, he said, an opportunity not to be missed, and he proposed that the Council purchase the film, using money from the Clement Glenn Bequest. Mr Butler seconded the proposal. After Mr Butler had said, in reply to a question from Mr H W Rogers (London County), that the drafts of the two booklets mentioned at the start of the report had yet to be circulated among the committee members, the report was adopted. There followed a discussion on the proposal to buy a copy of the film, both Mr C K Lewis (Honorary) and Mr W G Wilson supporting the idea. In reply to a question from Mr M J Church (Guildford), the Secretary confirmed that money was available for this purpose in the Clement Glenn Bequest and Mr Chaddock said that careful thought would be given to insuring the file against damage or loss if it were acquired; he did not think it would be possible to acquire the copyright of the film, as Mr D J Roberts (Devonshire Guild) tentatively suggested, or to obtain an 8mm version. The Council agreed on a vote to purchase a copy of the film, and the President congratulated Mr Chaddock on his initiative in the matter. In last year’s report it was stated that an estimated £1,000 would have to be borrowed to cover the cost of printing that was required. Owing to the Doubles book still not being available, and the new “mini” version of the Towers and Bells Handbook apparently not making much progress, this was not required. It has been noticed that a number of associations have taken the Publications Committee’s suggestion that they have a representative to handle the sale of Central Council publications for them. With the high cost of postage this must be beneficial to their members. A meeting of the Publications Committee had been arranged for the end of November, but was postponed because I was in hospital. It has not yet been possible to rearrange this. During my indisposition a lot of extra work was undertaken by my wife, and on behalf of the committee I should like to express our thanks to her. Owing to her efforts orders were not delayed much, and the only problems were with general correspondence; this is being cleared as time becomes available. It is likely that the Council’s publications will have a new home in the near future; we hope this will not cause too many problems. Proposing adoption of the report, Mr G R Drew (Honorary) said that its last paragraph referred to his plans to move house, and not any intention to give up his post. He went on to say that he was concerned about the publication of material by other committees. It had been suggested that all such material should be handled by the Publications Committee, but the quantities involved posed problems. This would be discussed at a meeting later in the year to which Mr Butler, as chairman of the Education Committee, would be invited. Mr C J Groome (Peterborough) seconded, commenting that Mr Drew had been seriously ill during the past year and that thanks were due to him and Mrs Drew for the way they had coped with the work (applause). Mr M P Phipps (Derby) asked that the Committee should consider the possibility of giving extra discount for large orders, and Mr K J Darvill (Oxford Diocesan) enquired whether the selling price of publications allowed for all expenses, and not just the replacement cost. Mr Drew said that originally the aim had been to sell at the minimum price, but in recent years there had been a change in policy. The committee was working towards charging the full (replacement plus all expenses) cost while avoiding a sudden large increase in price. Prices will therefore continue their gradual increase. The major matters dealt with at our three meetings in 1976 were reported at the time to our readers on 2 April (p.283), 25 June (p.537) and 26 November (p.987). But once again the real evidence of our work is contained in the 51 issues (including two double issues) of The Ringing World during the year. Summarising, the 51 issues provided 1100 pages, plus 12 pages of supplements; one special issue; 50 cover pictures of churches, with accompanying articles; 378 other pictures; 21 technical articles and 51 others. Also included were compositions, cartoons, puzzles, extracts from 25, 40 and 50 years ago and we managed to cope with record numbers of peals and quarter-peals. On average we were able to give readers an extra four pages once a month. Our accounts for 1976 will be presented separately. Suffice it to say here that they show a surplus of income over expenditure of £4643, compared with £2470 the previous year. It will be recalled that from 1 January 1976 the price of the paper was increased to 15p a copy to take account of the 1975 increases in postal and printing charges etc. which were then estimated to cost some £5500. In fact the increased expenditure was just over £5000. Fortunately our income rose by more than £7000. As reported in The Ringing World, printing charges were up by 5% from 1 July 1976, and increased charges for paper come into effect from 1 January 1977. Nevertheless, after full consideration in November, aided by advice from our accountants as to the expected outcome at the year’s end, we felt able to maintain the price level from 1 January 1977 for the time being. At the same time we arranged for the advanced purchase of paper to save expected increased costs in the first half of 1977. Because of continuing inflation, it is prudent to expect to have to spend about £5000 more in 1977 than in 1976 and it will be seen that this rate of surplus could well not be repeated in 1977 if we were to maintain our present price for the whole year. We are glad to report that your Editor, Mr Charles Denyer, is to date remaining in good health and, as our paper shows, very much “in the chair”. Nevertheless we have continued our search for a possible successor in the, we hope, distant future. All that can be said at this time is that there is some light at the end of the tunnel. As regards the Guildford office, we are sure that after a full year’s work by Miss Bartlett it has never run so smoothly and efficiently, making the task of the Editor (and Chairman) very much easier. She also earned the written praise of our auditor for her exemplary work, which facilitated his task of producing our accounts. Last year we had to report that the average weekly circulation in February 1976 (5460) showed a drop in circulation of some 200 from the previous year, following on the price increase on 1 January 1975. The fall continued, though at a reduced rate, until mid-summer, since when the circulation has improved slightly - the comparable figure for February 1977 being 5373. We have done our best through appeals and special inserts in the R.W. to ensure that our readers know that the continued appearance of our paper at a reasonable price or even at all - must depend on maintained circulation. For such an increase we must rely on the efforts of our readers to persuade new ringers to become subscribers, we appeal more especially to members of the Council and other association officers who, as leaders of the Exercise, must appreciate the position should we meet the fate of so many of our contemporaries. Because of our surplus in 1976, we have since on the advice of our accountant been able to add some £2000 to our investment portfolio, bringing the total value, at cost, to £20,000 plus. This reserve must however be related to an estimated budget for 1977 of upwards of £50,000. Interest from the investments brought us a welcome amount of £1745 in 1976. We also report with pleasure that the action of the Council in obtaining registration as a charity has resulted in a tax refund, of which our share is about £1000, and which will appear in next year’s accounts. Once again our readers, especially these who ring quarter-peals, have been most generous with their donations and have contributed the magnificent amount of £3177 - some £350 more than last year’s record amount. It is this extra income which enables us to give readers extra pages on average every month and to maintain a higher quality paper than we could do otherwise. We thank them most sincerely and also all those whose contributions in kind fill our pages; our advertisers and the anonymous provider of an Index. Special thanks go to Messrs Goldsmith and Drake and their staff at Seven Corners Press Ltd. Their friendliness, interest and co-operation render possible the difficult task of producing a weekly newspaper on time - and on a shoe string. We must conclude by expressing our thanks to Mr C.W. Denyer, our Editor, for his continued work for the good of The Ringing World and to Miss Bartlett for running the office so efficiently. Neither of them keeps any account of the many hours’ work they do every week without any thought or prospect of additional reward, except the knowledge of a job well done. We thank most sincerely these officers of the Council who attend our meetings and are always helpful; Mr Douglas Hughes, our treasurer and also, with Mrs Hughes, our host at our meetings; Mr David Tate, accountant and auditor, for all his expert help, including time spent at our meetings where we are glad of his advice, and his successful negotiations with the Inland Revenue; and to Mr W. Cartwright for much unobtrusive help and advice. The Chairman wishes to express his gratitude for all the support he has received throughout the year from the other members of the Committee and for their own special contributions to the pages of our paper. Mr W G Wilson proposed the adoption of the report, saying that “The Ringing World” was now a £50,000-a-year business and drawing members’ attention to the continuing need to increase circulation. The journal was provided by the Council for the Exercise, which meant that Council members had not only the incentive, but the duty, to publicise it, he said. Although there had been a surplus of £4,000 in 1976, three-quarters of which had come from voluntary donations, the Committee was not complacent. It would do its best to maintain the present price for the rest of the year, although rising costs would use up last year’s surplus. Every effort was being made to economise on production costs and much gratitude was due to the Editor (Mr C W Denyer) and Miss Bartlett for the extra work they put in (applause). He also thanked the paper’s treasurer, Mr D Hughes, and accountant, Mr D A Tate, and the Council’s legal adviser, Mr W B Cartwright (Worcester), for their continued help. Finally he drew attention to the new Junior Page in the journal. This was being produced by Mr Iolo Davies of Aberystwyth, and he urged ringers to let him or the Editor know what they wanted here and to provide contributions so that it would be a success. Miss Bartlett was leaving soon, to general regret, but he thought the committee might have found a replacement; and the question of a successor for the present Editor - whom he hoped would be in post for some time yet - was under active consideration, with a possible solution now in sight. Seconding, Mr M W Egglestone (Suffolk) said that the Junior Page had been suggested in a small random-sample survey he had held last year. As another result of that survey he had built up a list of some 70 addresses of accommodation recommended by ringers on tour, and was planning to circularise them with a view to obtaining advertisements for “The Ringing World”. Mr H W Rogers, as a member with no connection with the production of the paper, thanked the committee for all its work. Although in the past some of the committee’s reports had caused dissatisfaction in the Council, recent reports, written during times of great economic difficulty, had been very encouraging. He endorsed the thanks that had already been expressed to various people, but felt that special thanks were due to the committee’s chairman (applause). Mr J S Barnes (Cumberland Youths) enquired whether, since the Council was now registered as a charity, there was any possibility of subscriptions being paid by covenant to the Council with consequent benefit to Ringing World finances; Mr Wilson said he would look into the idea. Mr G A Halls expressed the thanks of the Derby Diocesan Guild for the recent excellent issue on Derbyshire which had, he said, been very well received. Mr C W Pipe said that he had been very impressed by the first paragraph of the committee’s report and suggested that it should be read out at as many ringers’ meetings as possible. After Mr W Butler had queried the range of dates for the inclusion of Jubilee peals in the planned Jubilee issue of “The Ringing World”, and had been told by Mr Wilson that they had been intended to cover the time from the weekend preceding to the weekend following June 7, the report was adopted. As it was now 12.45, the Council broke for lunch at this point, re-assembling at 2 o’clock for the afternoon session. The President opened the session by reading an apology for absence he had just received from Mr W Ayre (Life), who had been elected to the Council in 1926 and was thus its longest serving member. He was sure, he said, that the Council would wish to extend him its very best wishes (applause). The consideration of committee reports then continued with the accounts of “The Ringing World”. Mr Wilson reminded members that the selling price of the paper had been increased from 12½p to 15p from 1 January 1976, and advertising charges had been similarly increased. The use of offset-litho for certain parts of the paper had enabled the expenditure on blocks to be cut by some 50% during the year, and a similar reduction in the cost of postage, stationery and sundries was largely thanks to Miss Bartlett’s efforts. The market value of investments, which had cost £18,239, was £18,602 at the end of December, some £19,100 in March, and had probably increased since then. In March it had been agreed to invest a further £3,000 - £2,000 from last year’s surplus and the £1,000 tax refund. Total investments still represented only six months’ working capital, but were increasing. Mr A M Barber (Ely) asked what the nominal value of the Midland Bank Loan Stock was. Mr Wilson did not have the figures immediately to hand, but promised to let Mr Barber know outside the nesting. He also explained, in reply to a question from Mr D E House (College Youths), that the increase in carriage costs had arisen because facilities for delivery of copies to the station at a purely nominal charge were no longer available. There being no further questions, the Secretary proposed the adoption of the Council’s accounts as a whole. This was seconded by Dr J C Baldwin (Llandaff and Monmouth), and agreed. The year 1976 was one of great change for the Central Council Library. In February there occurred the sudden death of the Hon. Librarian, Frederick Sharpe, who over the years had done so much for the Library. His death meant, of course, that the normal work of the Library was suspended for a time until the election of the new Librarian at the Hereford meeting. This meeting also marked the opening of a new era in the Library’s history, with the setting up of the Library Committee. This has meant that exciting new possibilities for the development of the Library can now be considered - schemes which would have been beyond the scope of one person acting on his own to put into operation. The Sound of Bells, E.C. Shepherd, 1964. Presented by the Author. Inertia Forces due to Bell-Ringing, J. Heyman and B.D. Threlfall, 1976. Presented by B.D. Threlfall. A Simple Method of Extracting F.C.H’s. A.R. Carter 1976. Presented by the author. Carillons in the U.S.A. and Canada. Louise E. Torrance, 1972. Presented by Jean Sanderson. Various Association and Guild Reports for 1975. The Librarian apologises to anyone he may have omitted from this list, and regrets being unable to list donations of books and pamphlets received between the end of 1974 and his election to office. He would like to say, however, how grateful the Library Committee is to all these donors, and to express the hope that authors of books about bells and bell-ringing will continue to be generous with donations of copies of their works to the Library. Indeed, donations of any items of interest from anyone else will be most welcome. Among the work on which the Committee has made a start is the compilation of lists of the contents of other libraries and collections, making enquiries about the rebinding of books, giving wider publicity to the Library and its work, investigating the possibility of expansion of the audio-visual side, and consideration of ways of financing further projects for the Library’s expansion. At the last meeting it was also resolved that the Library Committee report to the 1977 meeting on its future financial requirements and how these should be met. The Committee estimates that it will need at least £100 annually of which about two-thirds will be spent on new acquisitions. We therefore recommend that an annual grant of £50 be made to the Library from the Central Council’s funds. The Library Committee will undertake to attempt to raise the remaining £50 in a variety of ways, principally by forming a “Friends of the Library” scheme. No. 60. Ropesight. J.W. Snowdon. 8th edition. 720. Church Bells of Berkshire, 2nd edn. F. Sharpe. The Librarian would be pleased to hear from anyone who can inform him as to the whereabouts of any of these books. Mr W T Cook, who moved the report’s adoption, said that publicity had lead to increased use of the library. He would welcome donations of any sort - he was very grateful for the £7 he had received since writing the report - and said that it did not matter if copies of books already in the library were given since it was agreed Council policy to sell excess copies of books printed since about 1850. He was particularly anxious to build up a stock of audio-visual material and of Association reports. He said that the Administrative Committee had suggested obtaining a special book-plate in memory of the previous Librarian, Mr F Sharpe, and that any books purchased this year should be inscribed to the latter’s memory. Turning to finance, Mr Cook said that there were a number of books which ought to be in the library but were not, and that there was a large amount of rebinding necessary, including a set of “Church Bells”. After Mr J S Barnes had seconded, Dean Thurlow (Life) enquired whether copies of Association reports etc. were being sent to the British Library. Mr Cook said that he did not know, and Mr F E Dukes said that an offer of the “Irish Bell News” to the Library had been declined. Mr G A Dawson asked whether any library books had been sold last year or in previous years. Mr Cook said that none were sold in 1976; some had been sold in the past, and he thought the money might have been used to offset some of the cost of running the library at the time. Replying to Mr B D Threlfall (Cambridge University), he said he had no further information on the books listed in the report as missing. After the President had said that acceptance of the report would imply acceptance also of its financial recommendations, the report was adopted. The message was warmly applauded. The next item on the agenda was the report of the Towers and Belfries Committee. This has been the Committee’s first year without Fred Sharpe, and we still feel his loss very keenly. It has been a busy year for most of us, and the forecasts of bell restoration falling off because of financial difficulties have not been fulfilled: indeed one feature of this year’s reports is an apparent increase in work being done in very small, impecunious parishes. It is not always easy to be certain just how many jobs the Committee has done, because quite often more than one member is involved with the same problem: 125 is an approximate number. Most cases have been requests for general inspections and reports, often leading to rehanging, but as in previous years there is a steady and very encouraging rise in the number of places where we are asked to tell the local people how to maintain and often restore their bells and fittings. One very small parish with a ring of four and an exceptionally enterprising parishioner asked for a design for a new frame which he is going to make from timber given to the Church. A breakdown by counties would not be very illuminating, as there are large variations across the country. The presence of a Committee member in an area encourages parishes to seek advice who might otherwise manage without it: and many parts of the country are served very well by bell consultants who are not members of the Council but who for the most part keep in touch with us. There also seems to be some variation in the amount of bell restoration being done between one area and another. Sound-control produced fewer enquiries than in the last few years, which is surprising in view of the recent changes in the law: we are sometimes asked for generalised guidance on sound-control, but we have to reply that every tower is unique in many different ways, and no general rules would be of much use. One could easily give details of methods which would be certain of some success, but in very many cases the local conditions would allow of much simpler and cheaper methods than those which would be sure to work anywhere. We can only say that we will help anywhere we are asked, provided our out-of-pocket expenses can be met. A problem relating to clapper weight has led one of our engineer members to do some research on this subject which when completed could be very useful. The new Maintenance Handbook is nearly ready for the Press. Although it has no monopoly of expertise or knowledge of bell and tower restoration and repair, this Committee has something which exists nowhere else in the Exercise - a team of people with very varied specialised knowledge, working together as a team. We believe that no other body can provide the spread of technical, professional, practical and historical experience which this Committee can bring to the subject, and while we acknowledge and appreciate the good work being done by other bell consultants we offer then any help which we can give them. Proposing its adoption, the Revd J G M Scott explained that the Maintenance Handbook was awaiting some illustrations, the original photographs having been accidently destroyed during processing. He was seconded by Mr B D Threlfall. Considerable discussion then ensued on two paragraphs in the draft report that had been circulated to members, referring to a University of Strathclyde report on internal sound-control which had been received, but not yet studied in detail, by the committee. Discussion hinged an the dB level at which noise could cause hearing damage, Mr G A Halls in particular arguing that the figure quoted in the University’s report was too low. Mrs A Newing (University of Bristol), noting that the report had been produced by Strathclyde’s Department of Architectural Studies, said that the Department of Audiology at any hospital should be able to provide a medical opinion on the question. The Revd J G M Scott accepted that, since the report had not yet been seen by other committee members, he ought perhaps not to have mentioned it and that the reference to it should be deleted from the committee’s official report. This was agreed, on the proposition of Mr C J Groome, seconded by Mr G A Halls. The Committee’s main task of providing communication between authorities wishing to dispose of redundant bells and associations or individuals requiring bells has continued throughout the year. It was reported to the Council at Hereford that a seminar was to be held, this took place on 11 December, and proved to be a highlight of the year. 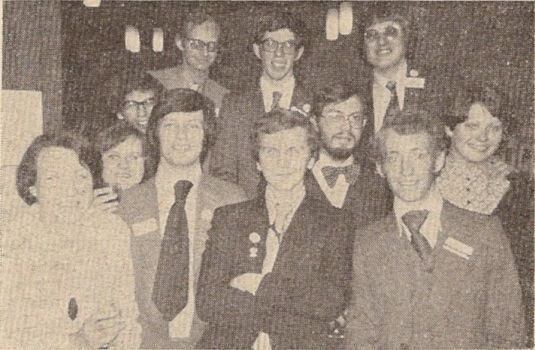 Some 35 ringers attended, representing 22 affiliated societies or associations, and a very full report of the seminar appeared in The Ringing World issues of 4 and 11 February 1977. Mr D.G. Ward, Secretary of the Church Commissioners Redundant Churches Department, reviewed the working of the Pastoral Measure; members of the Committee assisted by Mr Ranald Clouston covered financial and technical aspects of transferring redundant bells; and examples of how this worked out in practice were given by Miss Mary Bliss, Mr W.L. Exton and Mr George Massey. One of the main conclusions which emerged was the importance of local associations keeping in close contact with the bishop’s representative in each diocese (often a redundant churches Furnishings Officer) dealing with the disposal of redundant bells. The Committee is hopeful that the seminar will lead to a greater degree of understanding by local associations of the erratic nature of the Pastoral Measure. Such awareness could help reduce losses of redundant bells with consequent benefit to the church and to bell ringers. During 1976 some sixty cases concerning possibly redundant bells were referred to this Committee. Enquiries were spread fairly evenly over the whole country. We should again emphasise at this point that these cases do not of course represent the total picture of redundant bells. Many associations continue their own valuable work in this field and it is often only when the problem cannot be solved locally that this Committee becomes involved. We received 28 requests for “hardware” including frames (3), rings (7), and single bells, or pairs, for augmentation of existing rings (18). In 14 cases offers of bells resulted from likely sources being put in contact with enquirers and currently 7 transfers of single bells or rings of bells are in varying stages of completion. Seen as part of the overall picture of redundant churches an additional 60 redundancies were declared in 1976, bringing the total at the end of the year to 599. Comparing the annual figure with 84 declarations in 1975 and a peak of 115 in 1973, the rate of redundancy is continuing to decline for the fourth year in succession. However, this rate may increase again if some dioceses where redundancies are hardly yet occurring eventually follow the pattern of the remainder. Many ringers have asked whether lists of redundant bells may be made available. The register maintained by our secretary is kept up-to-date by information gleaned from many sources, and specific requests for bells are always matched against this register. To be as comprehensive as possible this register includes bells of widely varying degrees of availability and is subject to frequent and rapid changes. For instance, as soon as a church is declared redundant a note is made of the bells it contains, but they may never be available for transfer. Negotiations on the future of a redundant church and its fittings are often wide-ranging and their fate may be sealed at very short notice. If this involves demolition of the church, disposal of the bells may be a matter of urgency, yet other possibilities may have absolutely precluded their removal at any earlier date. For this reason the Committee is sure that continued close working by the local associations with their diocesan redundant churches officers - as was illustrated by association representatives at the seminar - is the best way to avoid losses of redundant bells. Examples from this year’s cases show how easily a ring of bells can “slip through fingers”, and how success can be achieved. Emmanuel Church, Clifton, was a classic case of where one part of the Church of England appeared at variance with another part. The archdeacon was convinced that there was no question of the bells being broken up, apparently unaware that the Redundant Furnishings Officer had already sold them as scrap. Going from one extreme to the other, the ring of four bells from the redundant church of Chellington, Bedfordshire, after having been stored for many years (at diocesan expense) at the Loughborough bell foundry, are new being augmented to six and transferred to Little Gaddesden, Hertfordshire. The ring of eight bells from St Matthew, Upper Clapton, after having been offered for scrap, were transferred through help from the London County Association to Watton at Stone, Hertfordshire. This was made possible only by close liaison between the Hertfordshire ringers and their Diocesan Advisory Committee enabling at short notice disposal of their cracked and poor-toned bells to the foundry (in place of the Upper Clapton ring) and transfer of two of the others, one to Sutton Bonnington, Nottinghamshire, and the other to a new church at Upper Clapton. We are again most grateful to Mr Ranald Clouston for supplying us with copies of his notes on bells prepared for the Council for Places of Worship. Illness has prevented Dennis Beresford from taking part in this year’s activities as he normally would have done. In past years much of the burden of the Committee’s work has fallen on the Chairman, and in wishing him a speedy and full recovery the Committee would like to record their thanks to him for his leadership. In the absence of the committee’s chairman, Mr D Beresford (Cumberland Youths), Mr A J Frost (University of London) moved its adoption. He added that reports had recently been received of people touting for redundant bells at unduly low scrap prices, and warned of such approaches. The register of redundant bells maintained by Mrs M J Wilkinson was constantly being updated, he said, and any enquiries should be directed to her; she had also agreed to serve as committee chairman for the remaining year of the present Council. Mr J Freeman seconded, and the report was adopted. The President said that he was sure the Council would wish the Secretary is write to Mr Beresford, expressing regret that he should have found it necessary to resign from the committee and sending best wishes for a speedy return to full health (hear, hear). Mrs Wilkinson confirmed that a great debt was due to Mr Beresford, who had been primarily responsible for the establishment of the committee. After an half-hour break for tea, the next report was considered. The Committee has met twice during the year, in November at Orpington and in February at Oxford. An important feature of the year’s work was the publication at the Council meeting at Hereford of the booklet “Bell Restoration Funds”. It has had an encouraging reception and has sold so well that a second edition is being prepared. At Hereford a survey of Guild bell restoration funds was presented, the result of a considerable amount of work by Mr Gordon Halls with the help of Council representatives of affiliated Guilds. Mr Halls spoke on the optimum percentage balance which he estimated should be maintained in Funds (see The Ringing World, 4th February 1977). The survey showed that the total capital invested in 1974 stood at only £30,000 and that the average amount given per ringer per year to bell restoration funds in 1974 was as low as 47p. Three applications have been received for assistance and as a result of information supplied by this Committee, a Kent church received (or had promises of) £1,700 and a Gloucestershire church found a source of an estimated £700 which it was subsequently unnecessary to take up. The third applicant, a Dorset church, has been unsuccessful from the sources supplied but has received a grant of £500 from the Barron Bell Trust. The Committee has also offered assistance in other instances where it has seemed appropriate. The Committee discussed a paper submitted by Mr Michael Foulds entitled “Application of the Basic Fundamentals of Investment to Bell Restoration Funds”. Indeed, some of Mr Foulds points were incorporated in our booklet. The paper stated that, as inflation was eroding the value of the funds faster than any investment policy could add to them, the best investment a bell restoration fund could make was in maintaining bells. It also set out the clear advantages which would result were Guild Bell Restoration Funds amalgamated into one large fund, operated perhaps by members of the Central Council, who could form a limited company registered as a charity. The Committee would welcome comments on this idea. Several complaints have been received concerning the failure of the Trustees of the Barron Bell Trust to reply to letters, even when stamped-addressed envelopes had been enclosed. Advice has been sought from the Charity Commission, which has endeavoured to impress upon the Clerk to the Trustees the need to acknowledge applications so as to obviate this cause of complaint. Meanwhile, it would be helpful if the Committee could be notified of any continued failure to reply by the Trustees. Work currently being undertaken includes production of posters on the theme “Covenant to Charities”, an inquiry into the advantages and implications of registering a whole Guild as a Charity as opposed to merely its bell restoration fund, and research into the existence of Diocesan Church Repair Schemes. Help would be welcome with all those items. An article entitled “Operating a Covenant Scheme” is in draft form. It is clear that many small local charities and trusts exist which would be of use for bell and tower restoration. A considerable amount of local enquiry is necessary in order to discover their existence. We would alert ringers generally to the need to ferret out these sources of funds. At the request of the Committee Mr J.G. Cadman, an H.M. Inspector of Taxes, has written an article entitled “Bell Restoration Funds and Taxation Exemption on Grounds of Charity”, which has been submitted for publication in The Ringing World. The Committee is aware that the whole Exercise should benefit from the skills which individual ringers can offer. A register is therefore being compiled of those able to help in connection with bell restoration funds. We wish to express our gratitude for the help and technical information we continue to receive from ringers, not all of whom are Council members. Ringers able to offer help with investment, charity administration and covenanting, taxation, fund raising, design and production of posters, public relations, etc., are invited to write to the Chairman. It would be of considerable help to the Committee and its fund raising in general if, after every restoration, the Committee could be sent a detailed analysis of income. In November 1976 Mr Martin Fellows resigned from the Committee. Accepting his decision with regret, the other members wish to thank him for the contribution he has made, especially with regard to the booklet. To Guild officers and trustees who are responsible for restoration funds we would emphasise the value of good publicity in order to build up and maintain a healthy fund. Ringers should be invited to covenant annual donations, and at their death to leave a bequest. In connection with the latter, gifts of residue in the form of stocks and shares, are free of capital gains tax and capital transfer tax when given to a charity. Forms of covenant and of legacy should always be available. In proposing adoption of the report, Mr J S Barnes said that Mr E Billings (Peterborough) had been co-opted to the committee in place of Mr M D Fellows (Worcestershire). Continuing, he said that he had just heard of a church in Cumbria that had received £2,000 as the result of advice given by the committee, which had now obtained a computer listing of trusts likely to be sympathetic to bell restorations. He had also learned that the model Code of Rules for a bell restoration fund, given in the “Bell Restoration Funds” booklet, was unacceptable to the Liverpool office of the Charity Commission - although it had been agreed with the London office. A revised edition of the booklet would be available through the Publications Committee in the near future. From figures provided by the founders, some £191,000 had been spent on bell restoration during 1975, and £226,000 in 1976. If societies were to provide roughly 10% of the cost of restorations, as some were trying to do, their expenditure would have to double its present level. After Mr K S B Croft had seconded, Mr P M J Gray (Australia and New Zealand) said that he had great admiration for the committee and considered their work outstanding, but was wondering what plans they had for disseminating the information they had collected. Mr Barnes said that a second edition of their booklet was in preparation, the Charity Aid Foundation was considering producing three Charity posters devised by the committee, and an article on the operation of a covenant scheme was shortly to appear in “The Ringing World”; but the main work of the committee was the provision of specific help and advice to individual enquirers. There are still several years’ work to be done. The last point was taken up by Mr D Martin (Durham and Newcastle), who wondered whether the committee should not become a permanent one rather than ad hoc, as at present. The President felt that this could best be pursued next year, when all the committees were due for re-election. Mr M J Church asked whether it was true, as stated in the “Bell Restoration Funds” booklet, that every bell restoration fund was required by law to be registered as a charity. Mr Barnes said that any fund that was not registered was liable to Corporation Tax at 52% on its investment income, although he had a feeling that this did not apply below a certain figure. As a registered charity, a fund would not be liable to tax. Mr N J Diserens (Oxford Guild) spoke against the amalgamation of restoration funds, an idea mentioned in the committee’s report. There was the very real danger that a central fund would be too impersonal and could add to the difficulties of raising money, he felt. After Dean Thurlow had commented that at Gloucester it had been found possible to add a bell restoration fund to another restoration fund which was already registered as a charity, and thus avoid the need for separate registration, the report was adopted. 4231 peals were rung in 1976, compared with 4236 in 1975, 3761 on tower bells and 470 on handbells. More tower bell peals were rung than in any previous year, but only an increase of about five. There has been a slight reduction in the number of peals of Minor and Maximus, and a corresponding increase in peals of Major and Royal. Odd-bell peals (Grandsire and Stedman) were also fewer. The Oxford Diocesan Guild has the greatest aggregate number of peals for the year with 280, itself a record. However the Kent County Association rang the most tower bell peals (245), and the Chester Diocesan Guild the most in hand (81). Compared with a similar list for 1975, Bath & Wells and Gloucester & Bristol have come in and Essex, Worcestershire & Districts, and Sussex have dropped out. The Devonshire Association, Irish Association, Ladies Guild, Railwaymen’s Guild, and St David’s Diocesan Guild did not ring any peals in 1976. The number of non-affiliated societies ringing peals increased from 15 to 23. * In last year’s list of towers with 10 or more peals. There were 597 first pealers in 1976, 27 less than in 1975; 92 ringers conducted their first peal, one more than in 1975. Australia & New Zealand Assn: local band peals in New Zealand. Chester Diocesan Guild: 13,664 Yorkshire Surprise Major and all-the-work 4-spliced Surprise Royal in hand. St Martin’s Guild: 12,144 Bristol Surprise Maximus at Birmingham; three peals of Maximus in one day by the same band. Suffolk Guild: Plain Bob Minor at Polstead, with 5 first pealers and first as conductor. Surrey Association: Plain Bob Major at Benhilton, with 5 first pealers. Accrington, 8 May. Plain Bob Cinques without a cover bell - not in accordance with the Rules. Addington, 6 Nov. 8640 Minimus in 13 methods - not in accordance with the Rules, since Kent and Oxford T.B. Minimus cannot be rung in 24s. We consider the Exercise should be more concerned with peals that are rung whose compositions are not subsequently published. This particularly applies to peals of unusual length, when it may be found that they do not conform to the Rules. A great deal of work is put into the report to try to ensure accuracy. It would help if society peal secretaries could send details of their own records to this Committee at the end of each year, so long as they arrive by the third week in February. By comparing notes in this way we can also help them. We are grateful for the help given by several societies, but consider it rude when enquiries about peals are ignored. After making some minor corrections to the report as circulated, Mr F B Lufkin (Essex) moved its adoption, and Mr C H Rogers (Middlesex) seconded. Mr J M Tyler said that he was surprised to see that a Peterborough Guild peal of 378 Doubles methods/variations had been omitted from section g., and Mr C K Lewis (Honorary) added that a Universities Association peal of half-lead spliced Cambridge and Yorkshire on handbells had apparently missed the committee’s notice. Mr Lufkin said the committee did not report everything it noticed. Mr A M Barber queried the word “about” in the first paragraph, but Mr N J Diserens explained that totals were constantly being amended as late peals trickled in, and it was consequently not safe to be dogmatic. Mr M C W Sherwood (Manchester University) wondered whether Kent TB could be called a popular Maximus method on the strength of two tower-bell peals. Mr C H Rogers pointed out in reply that it was the second most popular Maximus method on handbells. Mr G A Dawson proposed that the peal of Cinques at Accrington be recognised, since it was rung when there were only 11 bells in the tower and was thus a parallel to All Saints, Basingstoke. This was seconded by Mr B D Threlfall, and agreed by a majority vote. The report was then adopted as amended, 15 members voting against. Once again the main work of the Committee has been the checking of peal compositions. Hilary Muirhead and M.J. Hobbs have given their help cheerfully, and we offer them our thanks. 163 compositions have been checked, of which 19 were false. It remains the intention of the Committee to encourage composers to have their compositions checked before publication, and preferably before they are rung. When a peal has been checked, the result is sent to whoever submitted the composition to the Committee, either an individual or the Chairman of the Peal Compositions Committee. There have been complaints that the time between submission and publication in The Ringing World is too great. The remedy may be for composers to have their peals independently computer-checked before they are rung, and then to indicate who has carried out checks when submitting their work to the Peal Compositions Committee. The policy may appear harsh, but it is the Council’s wish that care is taken to prevent false peal compositions being published in The Ringing World. The rest of the work this year has been the passing of information on computing from ringer to ringer. Correspondence has been rather less than last year, with 55 communications received and sent. There has been notable interest in the PROVE-8 suite of programs developed by A.D. Leach for interactive checking of compositions on a PDP-8 computer. Material for implementation of PROVE-8 has been distributed to five different experimenters including R. Bennett of Christchurch, New Zealand. There have been enquiries about the various packages for generating inter-method falseness tables. D.R. Dewar has implemented the SiRil package in Birmingham and has developed an APL interactive proving program. W.O. Risinger, Jr., at the Massachusetts Institute of Technology is keen to begin using some ringing programs there, once we can devise a cheap way of transmitting the necessary material to him. Members of the Committee have continued their work on Central Council collections of methods. Surprise Major, Royal and Maximus rung up to the end of 1976 will be printed ready for the C.C. meeting. Treble-dodging Minor has not yet been finished, but R. Bailey is helping with this. Plain Major has been circulated for checking and comment. Little Surprise Major and Treble Bob and/or Delight Major will be done as soon as source data is available; J.R. Mayne is providing information for this. Mr J R Taylor (Gloucester and Bristol) proposed adoption of the report adding that the listing of Surprise methods mentioned in its last paragraph included also all Little Surprise methods so far rung; Dr J C Baldwin seconded. Mr A F Scholfield enquired why a peal submitted last November had still not been published in “The Ringing World”, but Mr Taylor, who did not know anything of the peal in question, suggested that the Peal Compositions Committee might be in a better position to answer. The report was adopted without further comment. Work is well advanced on the new collection of Major compositions. All compositions for it have been selected and it is hoped to have the new book published during 1977. Thanks to voluntary help from Mr R. Dennis, with has also begun on the production of an up-to-date edition of the Collection of Stedman Caters and Cinques. Future projects envisaged include a replacement for the Wratten Collection which, like the previous Major collection, is now sold out. Proposing the reports adoption, Mr W E Critchley (Honorary) said that Mr Dennis would welcome more compositions of Stedman Caters and Cinques for the new collection. Replying to Mr Scholfield, he said that it was insufficient merely to add “Computer proved” to a composition submitted for publication: details of where the checking had been done and by what program were needed - otherwise the composition would still have to be checked by the Computer Co-ordination Committee. Peal compositions were now being published regularly in “The Ringing World”. Mr A M Barber asked whether compositions included in letters were similarly checked, and Mr Critchley said that his committee had no say as to what was published in the letter columns of “The Ringing World”. Mr C F Mew (Surrey) said that it would be helpful if corrections and withdrawals of compositions could always be published in the same place in the paper, and the report was then adopted. Jan. 1 5088 Bergodunum S. Major Yorkshire A. 1 5152 Hensingham S. Major Chester D.G. 7 5056 Oldwick S. Major Leicester D.G. 9 5152 Cherry Hinton D. Major Ely D.A. 12 5152 January S. Major Lancashire A. 17 5184 Easton Neston S. Major S. Northants. Soc. 24 5024 Xoanon S. Major Yorkshire A. 31 5088 Helios S. Major Yorkshire A.
Feb. 2 5152 Golden Ball D. Major Oxford Univ. Soc. 4 5056 Misterton S. Major Leicester D.G. 6 5184 Liden S. Major Gloucester & Bristol D.A. 7 5088 Rutupiae S. Major Yorkshire A. 14 5088 Camboglanna S. Major Yorkshire A. 14 5184 Maidens D. Major Winchester & Portsmouth D.G. 19 5184 February S. Major Lancashire A. 23 5024 Kea S. Major Sussex C.A. 26 5280 Bristol Little S. Maximus St Martin’s G.
28 5088 Venta Silurium S. Major Yorkshire A. 28 5040 Woodspring S. Royal Bath & Wells D.A. Mar. 6 5088 Coccium S. Major Yorkshire A. 8 5184 March S. Major Lancashire A. 12 5152 Toseland D. Major Ely D.A. 13 5280 Illinois S. Maximus Leicester D.G. 13 5054 Oxmoor S. Major Ely D.A. 20 5040 Barham D. Royal Beverley & Dis. Soc. 26 5040 Wealdstone Alliance Major Middlesex C.A. 27 5040 Daventry Little Alliance Royal S. Northants Soc. Apr. 3 5042 Essex S. Maximus Leicester D.G. 3 5184 Isca Dumnoviorum S. Major Yorkshire A. 5 5184 April S. Major Lancashire A. 19 5088 Zeta S. Major Yorkshire A. 20 5056 Bodicote S. Major Oxford D.G. 23 5088 Abbots Ripton S. Major Ely D.A. 23 5184 St George’s Day S. Major Gloucester & Bristol D.A. 24 5088 Mamucium S. Major Yorkshire A. 26 5184 Arpil S. Major Lancashire A. May 1 5100 Banwell Alliance Major Essex A. 1 5024 Khi S. Major Yorkshire A. 8 5040 Midsomer Norton S. Royal Bath & Wells D.A. 10 5024 May S. Major Lancashire A. 15 5152 Totley T.B. Major Dronoldore Soc. 28 5040 Headstone Alliance Major Middlesex C.A. June 12 5086 East Bergholt S. Major Suffolk G.
14 5120 June S. Major Lancashire A. 19 5152 Dronfield D. Major Dronoldore Soc. 19 5088 Lavatrae S. Major Yorkshire A. 21 5024 Callipygean D. Major Oxford Univ. Soc. 25 5088 Kings Ripton S. Major Ely D.A. 26 5088 Follifoot S. Major Yorkshire A. 26 5056 Lydney Little S. Royal Gloucester & Bristol D.A. July 3 5183 Stroud Bob Caters Gloucester & Bristol D.A. 4 5040 Atlantic Alliance Major Middlesex C.A. 5 5024 July S. Major Lancashire A. 10 5040 Little Smeaton Little S. Major Yorkshire A. 10 5184 Trimontium S. Major Yorkshire A. 16 5152 Icklesham S. Major Bath & Wells D.A. 17 5056 Ashbourne D. Major Yorkshire A. 17 5088 Pontium S. Major Yorkshire A. 18 5024 Wimbish S. Major Ely D.A. 23 5022 Upware S. Major Ely D.A. 23 5040 Whetstone Alliance Major Middlesex C.A. 25 5040 Enniskillen S. Royal Lancashire A. 31 5120 Denny D. Major S. Northants Soc. 31 5056 Usmere S. Major Worcestershire & Dist. A.
Aug. 8 5086 Farningham S. Major Kent C.A. 13 5056 Yelling S. Major Ely D.A. 14 5088 Nidum S. Major Yorkshire A. 21 5088 Anderida S. Major Sussex C.A. 21 5088 Durovernum Cantiocorum S. Major Yorkshire A. 21 5088 Thamesford S. Major Kent C.A. 22 5040 Blackburn S. Royal Lancashire A. 23 5184 Deane S. Major Lancashire A. 23 5088 Walkden S. Major Lancashire A. 24 5184 Stretford S. Major Lancashire A. 26 5088 Helmshore S. Major Lancashire A. 27 5056 Oswaldtwistle S. Major Lancashire A. 27 5152 Cliff-at-Hoo Cliffe-at-Hoo S. Major Kent C.A. 28 5024 Walton-le-Dale S. Major Lancashire A. 30 5024 August S. Major Lancashire A.
Sept. 3 5016 Belfast Little S. Major St Thomas Soc. 8 5152 Tumbelataurea Lomeanor S. Major Oxford D.G. 11 5280 Uxbridge S. Maximus Soc. of Royal Cumberland Y. 13 5152 September S. Major Lancashire A. 16 5056 Vaternish S. Major Leicester D.G. 19 5088 Dawn S. Major Bath & Wells D.A. 21 5040 Rayleigh Bob Major St Thomas Soc. 25 5152 Handsworth T.B. Major Yorkshire A. 25 5088 Rigodunum S. Major Yorkshire A.
Oct. 2 5024 Calleva S. Major Yorkshire A. 9 5056 Vale of the White Horse S. Major Oxford D.G. 11 5152 October S. Major Lancashire A. 15 5184 Cleeve S. Major Bath & Wells D.A. 22 5152 Fen Drayton S. Major Ely D.A. 23 5152 Barrow-upon-Soar S. Major Leicester D.G. 23 5152 Congresbury S. Major Bath & Wells D.A. 23 5088 Elston D. Major Ely D.A. 23 5184 Maglona S. Major Yorkshire A. 23 5120 St Columb Major S. Northants Soc. Nov. 6 5184 Chumscote S. Major S. Northants Soc. 6 5088 Darius S. Major Oxford D.G. 8 5088 November S. Major Lancashire A. 19 5056 Dry Drayton D. Major Ely D.A. 19 5040 Stanwell Little Bob Caters Middlesex C.A. 20 5088 Durolipons S. Major Yorkshire A. 20 5056 Zululand S. Major Oxford D.G. 23 5280 Barkers D. Major Oxford D.G. Dec. 4 5056 Uganda S. Major Oxford D.G. 6 5120 December S. Major Lancashire A. 8 5152 Chandler’s Ford S. Major Winchester & Portsmouth D.G. 18 5280 Easton Neston T.B. Major S. Northants Soc. 18 5056 Amblecote S. Major Worcestershire & Dist. A. 27 5120 Durobrivae S. Major Yorkshire A. 27 5088 Marple S. Major Chester D.G. 27 5040 Schofield Alliance Major Peterborough D.G. 27 5056 Wealdstone Alliance Royal Oxford D.G. 28 5056 Flixton S. Major Chester D.G. 28 5088 Radcliffe S. Major Peterborough D.G. 30 5088 Purston S. Major S. Northants Soc. 31 5040 Kenton Alliance Major Middlesex C.A. Jan. 29 5040 Rutland S. Royal Oxford D.G. May 26 5096 Cambridge S. Fourteen Oxford D.G. Nov. 6 17,729 Grandsire Caters Leicester D.G. 27 12,144 Bristol S. Maximus St Martin’s G.
Apr. 17 13,664 Yorkshire S. Major Chester D.G. After making a number of corrections to the report as circulated to members, Mr D E Sibson proposed its adoption. He added that, as a result of the work on the Surprise methods collection, it had become apparent that the method rung on March 6 at Town Hall Little Surprise Royal had earlier been rung as Little Ashfield Little Surprise Royal; this means that the Town Hall Little Surprise Maximus included in the 1975 report should have been named Little Ashfield also. Mr J R Mayne seconded. The Revd J G.M Scott questioned the spelling of Isca Dumnoviorum, but was assured that that spelling had been used in the peal report. This prompted Mr J Hartless to comment that he had always thought change-ringing an English invention, not a Roman one, and could not the Yorkshire Association peal band responsible translate its names into English? The committee had no written report, but its chairman, Mr F T Blagrove, said that a decision was needed on the recommendations made last year so that it could go ahead with producing the new Doubles Collection. Replying to the President, he said that the essence of the recommendation was the definition of a standard call for Plain Doubles methods; this was necessary since a Doubles variation was recognised by the use of a call other than the standard one for the method. The committee had recommended that a call that affected the bells only at the treble’s lead should be considered the “standard call”; the use of a call affecting bells when the treble was not leading (for example a Grandsire Single) when then mean a variation was being rung. He proposed that the recommendations be adopted, and Mr S Humphrey (Southwell) seconded. Mr D A Frith did not think that the report had been adequate enough for anyone to comment usefully, and considered that more information was needed before the Council could reach a decision. Dr J C Baldwin pointed out that the report had been published in “The Ringing World” a year ago, giving ample time for any problems to be elucidated, and Mr Blagrove added that its acceptance would not cut out any methods. Mr Frith said that he would be prepared to withdraw his objections if by so doing he could be sure the Doubles collection would soon be available. There was a great demand for a book of this nature, and if the committee was not going to do something soon, perhaps someone else could. In reply, Mr Blagrove said that he had consulted the chairman of the Publications Committee, and it seemed that two books were needed, one containing the basic plain Doubles methods given in leads rather than by notation, and the second Little, Alliance and other methods; details of Doubles variations could perhaps be duplicated. On being put to the vote, the recommendations were accepted by the Council. This being the last of the Committee reports, the President expressed thanks to all the committee members and the various trustees for their work during the year. The Secretary said that the Administrative Committee had accepted an invitation from the Guildford Diocesan Guild to hold its 1978 meeting in Guildford. Since the Bank Holiday Monday would fall on May 29, he proposed that the meeting be held on May 30. Mr W F Moreton (Yorkshire) seconded, and the proposal was agreed on a show of hands. The Secretary said that no invitation had been received for the 1979 meeting. Mr P A Corby (Kent) extended an invitation to the Council to hold its 1981 meeting in Kent. He said that this would enable the President, who was a vice-president and very active member of the Kent County Association, to preside over a meeting in his home county during the Association’s centenary year. The President said the invitation would be noted, and reminded members that invitations had now been received for 1980 (from the Winchester and Portsmouth Diocesan Guild), 1981 (Kent County Association), 1982 (from both the Salisbury Diocesan Guild and the Bedfordshire Association), and 1985 (from the Sussex County Association). He added that the Council was not necessarily committed to holding its business meeting on Bank Holiday Tuesday. The Secretary read a letter he had received from the Revd John Blyth, Rector of Launton, saying that it was intended to erect a tablet in Launton Church to the memory of the late Frederick Sharpe and asking whether the Council would like to contribute towards its cost. The President recalled that the Council had paid £10 to the Oxford Diocesan Guild’s Sharpe/Wigg memorial appeal, and wondered whether a “retiring collection” might be appropriate. Dr T G Pett (Oxford Guild) said that his Guild’s appeal had raised just over £700. Some £350 of this would be used to pay for two memorial tablets in Christ Church cloisters, where they would join three tablets already there in memory of earlier Guild masters; and the remainder would go to North Winchendon towards the cost of rehanging the bells there. There was thus no money left in this fund to go towards the cost of the Launton tablet, but the Oxford Guild had made a separate contribution to the latter. Mr W G Wilson said that the Council could not ignore the Rector of Launton’s letter or refuse to make a grant; he proposed a donation of £10, a suggestion seconded by Mr C W Denyer. Mr P A Corby said that he did not wish to detract from what had been said about Mr Sharpe, but it had not been Council policy in the past to make large donations in memory of past members. He felt the President’s suggestion more appropriate, and the Revd J G M Scott agreed. Mr C W Pipe then rose to plead the case for short peals, saying that he did not wish to alter the existing rules concerning peals but would like the Council to allow an exception to those rules in the case of emergency, so that if it were for some reason found impossible to complete a full peal anything that was brought round after 3,500 changes would be recognised as a Short Peal. after the Decision governing peals. The proposal caused a number of reactions, The Vice-President said that a peal by definition contained at least 5,000 changes, and suggested that the Short peal be called a “Pipe”; Mr Mayne thought a “Rind” more appropriate for a short piece of peal. Mr Diserens said that Mr Pipe was out of touch with the modern trend to metrication, and that a peal ought rather to consist of 10,000 changes: this would enable the present quarter-peal to be replaced by a decipeal of 1,000 changes, and a touch of 100 changes would become a centipeal (laughter). In more serious mood, Mr Corby said that proper notice had not been given of the proposed change and that there was the danger that if the Council voted on it, however light-heartedly, it might be thought that it had been seriously considered. Mr E Billings had seconded Mr Pipe’s proposal, but both agreed to withdraw it when asked by the President whether they wished it to be put to the vote. Mr G A Halls said that the Secretary had circulated a list of members and their qualifications and interests at the start of the present Council. This had been very helpful, and he asked that a similar list be circulated next year. The Secretary then announced details of attendance at the meeting. 167 of the Council’s members had signed the Roll, representing 59 of the 65 affiliated societies. This compared with the record attendance of 180 at Hereford last year. Mr W G Wilson expressed members’ thanks to the officers, particularly the President and Secretary, and also to Miss D E Colgate (Ladies’) for her assistance in recording the proceedings. On behalf of the Council the President thanked the Derby Diocesan Association for its arrangements for the meeting and for the whole week. As he was the most vocal, one tended to think mainly of Gordon Halls, he said to laughter, but there were very many others to whom a debt was owed: those who arranged the various functions, prepared and served the refreshments, took charge of the ringing, and manned the Association’s Information Desk. He thanked the various incumbents for the use of their bells, mentioning in particular the Revd R D St J Smith of Darley Dale, a former member of the Council who was retiring in August; the mayor, Bishop and Provost of Derby for their welcome, and the latter for allowing the Council to hold its Communion Service in the Cathedral that morning and for officiating, assisted by the Secretary of the Derby Association, the Revd. Fred Ross. The Carlisle Dioc Guild, Devon Association, Leeds Univ Society, North Staffordshire Association, St David’s Dioc Guild, and Scottish Association were not represented.